Please remember that we are giving our volunteers a break to spend time with their families this coming Sunday. 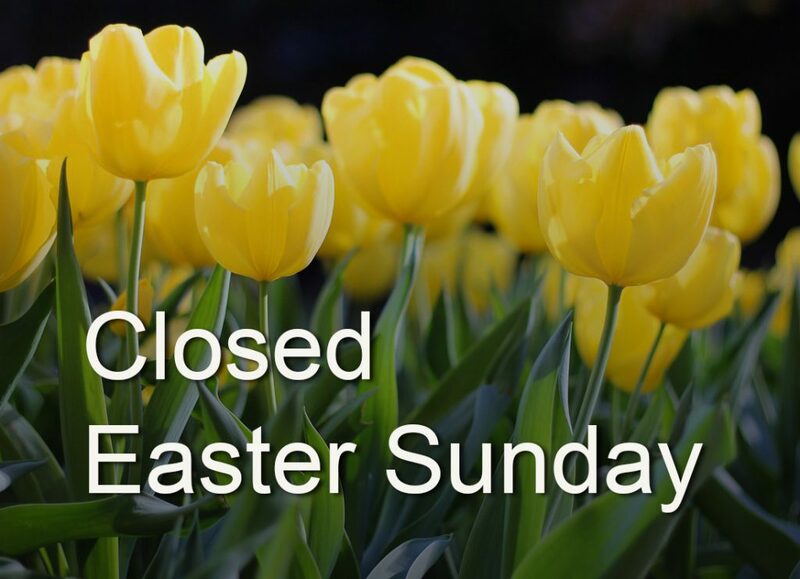 The library will be closed April 21st. Have You Signed Up Yet? You’ve seen him on TV tracking the ancestors of Oprah and Smokey Robinson. 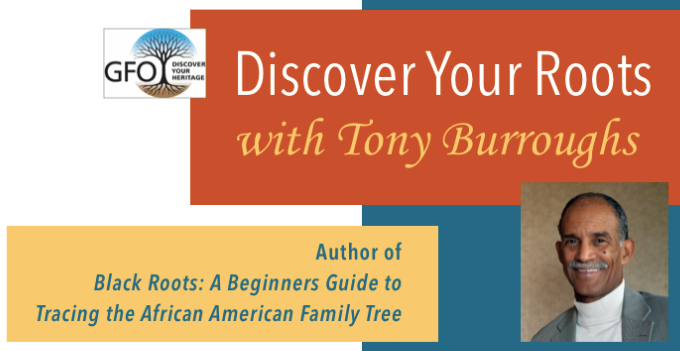 Now come hear Tony Burroughs the founder and CEO of the Center for Black Genealogy. Come learn from the master himself. He’s won multiple honors over the years and has been featured on national and international television programs. Burroughs is bringing six lessons to the GFO Spring Seminar from which anyone can learn, regardless of ethnic heritage. Burroughs told Portland’s The Skanner newspaper, “People need to understand, ‘What is fundamental genealogy? What are the methods of genealogical research? '” We have cut our usual seminar price in half for this event, thanks to generous support from The Skanner Foundation. Volunteers Still Needed for Spring Seminar! Thank you to everyone who has already volunteered for our Spring Seminar! We still could use another person or two, so if you’re thinking about helping out, we’d love to hear from you. Raffle tables will be set up so volunteers can see and hear the speaker/screen. Book sales tables will be set up so volunteers can see and hear the speaker/screen. To volunteer, please email seminar@gfo.org. Thanks! 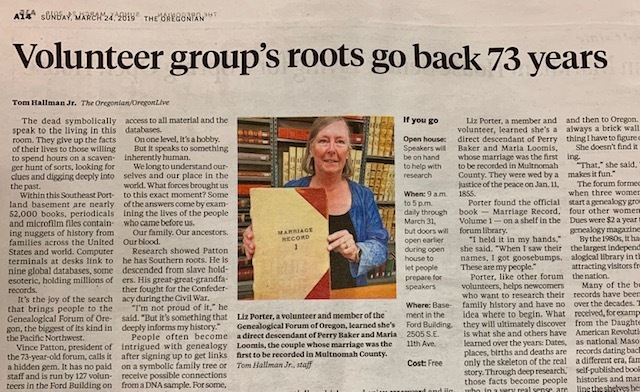 The Genealogical Forum of Oregon has a significant change to announce, one we do not take lightly. The GFO Library is now a non-circulating research library. We will no longer check out materials. 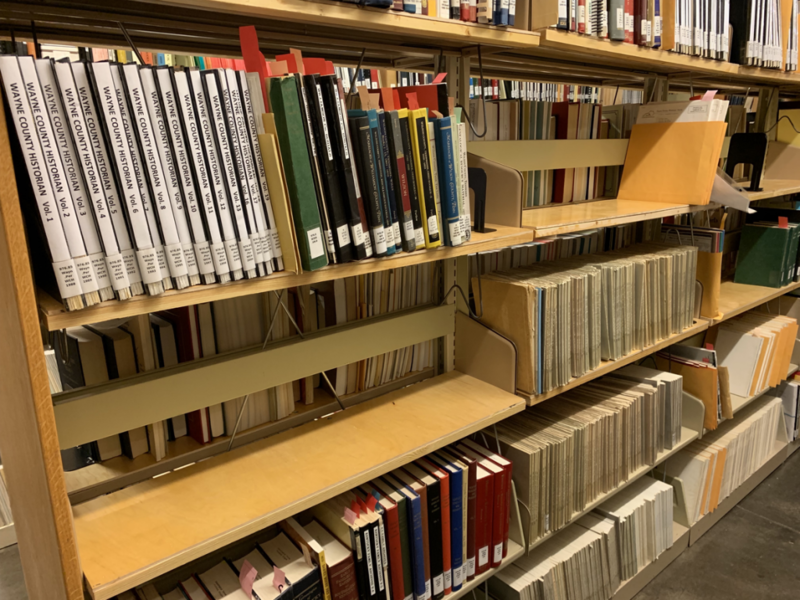 We need to protect our valuable holdings, and to ensure that all of our materials are available at all times, in the library, for researchers. There has been an increase in patrons from out of the area who visit us on a research trip. It’s a shame if the item they came in to use is not available. It also turned out we were out of step with most other genealogy libraries, which hold everything in reserve. In the grand scheme, only 10% of our holdings were available to be checked out, so this change will not affect the vast majority of the research materials you rely on. Any materials currently checked out must be returned by their due date. No renewals or extensions will be granted. The Library Committee deliberated this carefully, over many months, before recommending this change, and the Board of Directors has unanimously approved it. GenTalk this Saturday, April 20th! 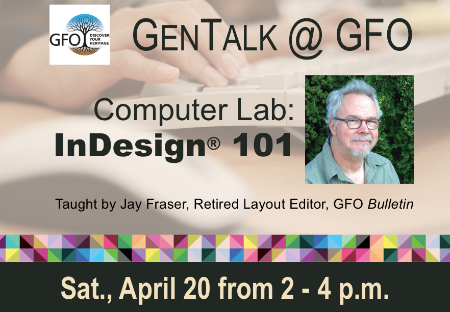 Please join us for our free, monthly GenTalk Saturday, April 20th 2:00 – 4:00 p.m. where presenter Jay Fraser, Retired Layout Editor of the GFO Bulletin, will discuss Adobe InDesign®️ Basics. Genealogy research isn’t just about finding the answer, it’s also about communicating the answer to others. From writing a book or assembling a photo album with stories, Adobe InDesign®️ can help make the look of your project more professional. InDesign®️ gives you excellent control of typography, page design, and book organization. It also has dynamic tools like indexing, cross-referencing, and table of contents. Begin to learn the basics of this powerful program in this special, two-hour GenTalk. If you own InDesign®️, please bring your laptop with the program loaded. Otherwise, you may follow along with the demonstration. 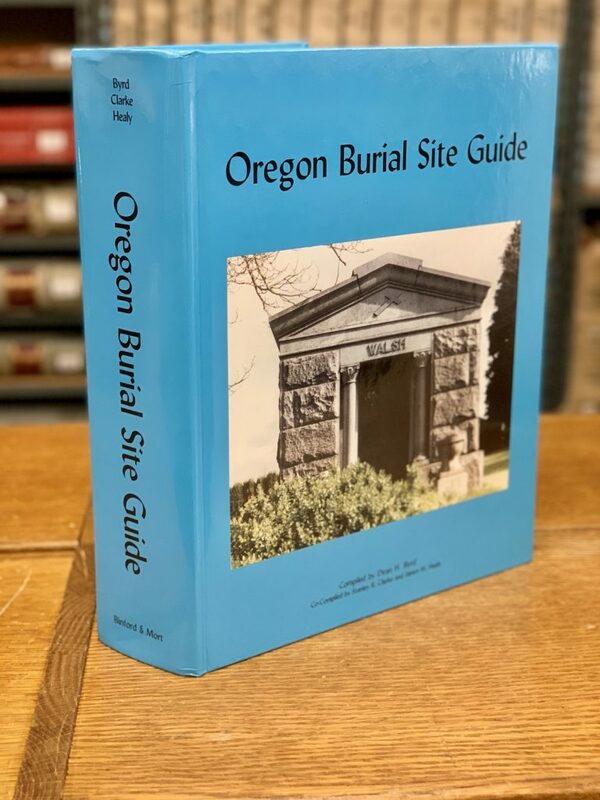 The mammoth Oregon Burial Site Guide is probably the most comprehensive compilation ever made of burial sites in our state. The work put into it reflects a truly astounding effort. 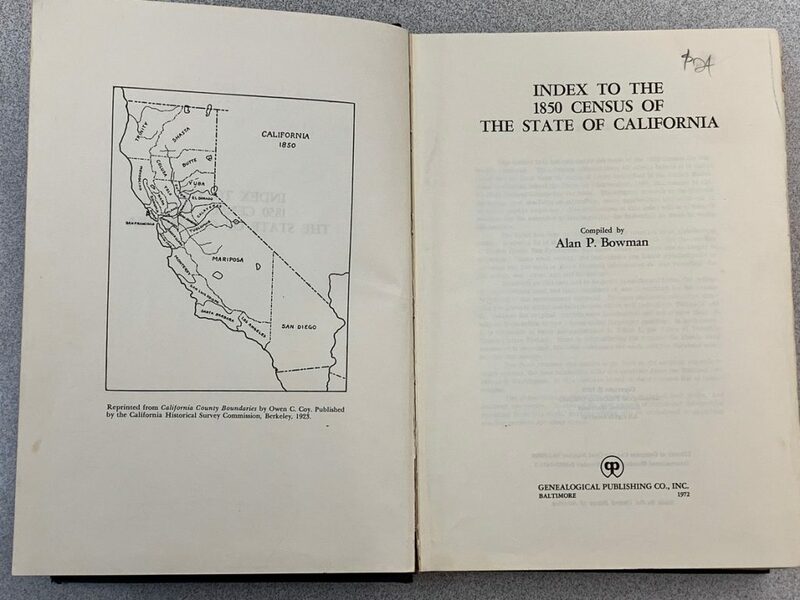 This 1180 page tome includes county-by-county compilations of cemetery locations at sites public, private, and otherwise, even some on family farms. Cemeteries owned by fraternal orders like the Masons, Odd Fellows, Knights of Pythias, and Noble Order of Redmen are revealed. Names of the buried have been gleaned from signs and cemetery records, compiled by Dean H. Byrd with the help of Stanley R. Clarke and Janice M. Healy and published in 2001. This 7-pound encyclopedia can be yours for: $ 5 if you pick it up in person at the GFO. $15 if we ship it to you. Contact booksales@gfo.org if you’d like your very own copy. Survey: How Deep Are Your Oregon Roots? Many Oregonians have deep multi-generational roots here. Others are recent transplants. How long ago did your kin arrive in Oregon? Who was the first of your ancestors to arrive? Last Week’s Results: 45% of you attend one of our Full-day Seminars. 35% of you attend both! And our Special Interest Groups appear popular. 57% say they attend 1 to 3 groups. Genealogy Problem Solvers 9:30 – 11:30 a.m.
Another Brick Wall comes tumbling down! Military documents reported Patrick Powers as a native of Ireland who came to the U,S, and then became a U,S, citizen in 1892 by virtue of his U.S. military service. His descendants knew nothing of his Irish roots or his family connections as his early death resulted in almost no verbal history for him. April’s Genealogy Problem Solvers presentation will demonstrate the use of a wide range of records in both the U.S. and Ireland, including detailed examination of Catholic Parish records, Civil records, and Valuation Renewal Books. Utilizing these records, we will pinpoint Patrick’s birthplace and identify some of his ancestors as well as additional kin. We will focus on how detailed examination of many records, the use of spreadsheets, a timeline, and even a distant DNA connection can contribute to finding the story of an elusive ancestor. Join us to learn how these techniques can help you in organizing your research. For more information or to inquire about how the group might help with your brick wall, contact Katie Daly at GPS@gfo.org. African American Ancestry Group 12:00 – 2:00 p.m. The focus of this group is researching African American ancestry. 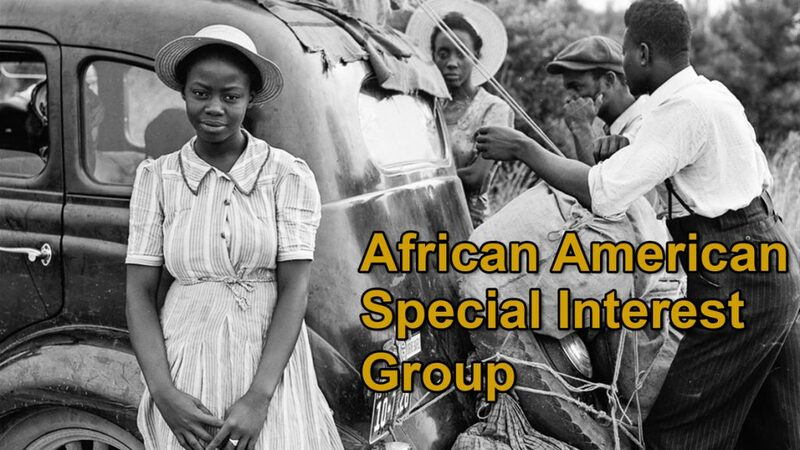 If you know of any other people interested in African American genealogy, tell them about the group. You do not have to be a GFO member to participate! For more information, contact us at african_american@gfo.org. GenTalk 2:00 – 4:00 p.m. Please join us for our free, monthly GenTalk where presenter Jay Fraser, Retired Layout Editor of the GFO Bulletin, will discuss Adobe InDesign®️ Basics. Learn how to make your projects more professional using the dynamic tools in this program. If you own InDesign®️, please bring your laptop with the program loaded. Otherwise, you may follow along with the demonstration. PMUG College 6:00 – 8:00 p.m.
Portland Mac Users Group College: Traversing the web on browsers and email. This class is free for GFO and PMUG members. You’ve seen him on TV tracking the ancestors of Oprah and Smokey Robinson. Now come learn from Tony Burroughs in person! He’s a master of research methods anyone can employ, and the founder of the founder and CEO of the Center for Black Genealogy. The Skanner interviewed Tony this week and has just published a story. This is a two-day event. Register for one or both days. We have cut our usual seminar price in half for this event, thanks to generous support from The Skanner Foundation. Saturday, April 27th, 10 a.m. – 4:30 p.m.
Tell Us What Helped You the Most at GFO’s Open House! 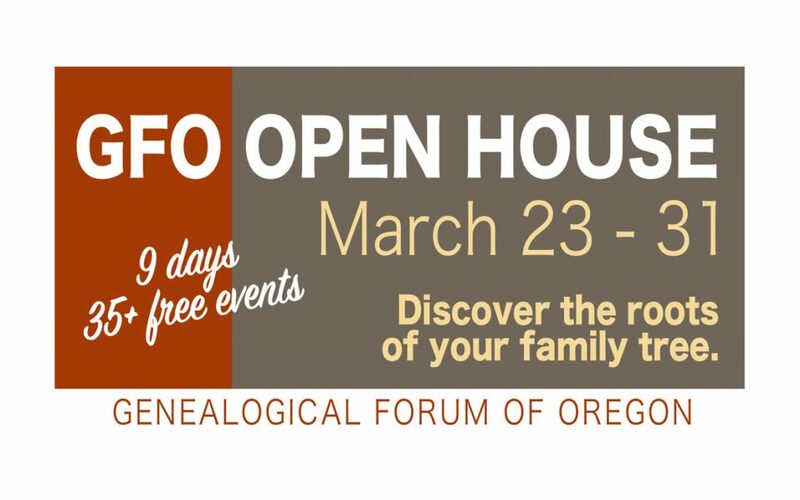 We were completely blown away by how many of you were able to join us for the Genealogical Forum of Oregon’s annual Open House. We met a lot of new faces, and we’re glad more people are learning we’re here. This year’s Open House set records for us. We’ve never had so many people visit in one week. Attendance was double last year! Please let us know what was your favorite classes were and what topics you’d like to see in the future. The Hatfields and the McCoys may be remembered as America’s most famous feud, “but it was relatively brief and subdued compared to the violence in Breathitt County, Kentucky.” T.R.C. 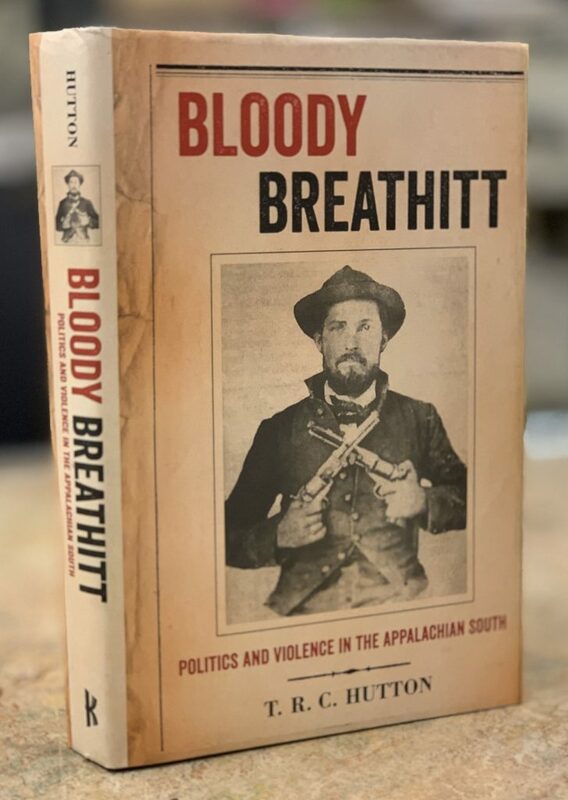 Hutton explores the politically motivated murders from the Civil War though the Progressive Era in “Bloody Breathitt – Politics and Violence in the Appalachian South.” We have a surplus copy of this book available in our bookstore. It’s brand new, superb condition and hard cover. Price: $36. Contact booksales@gfo.org if you’d like to buy it. 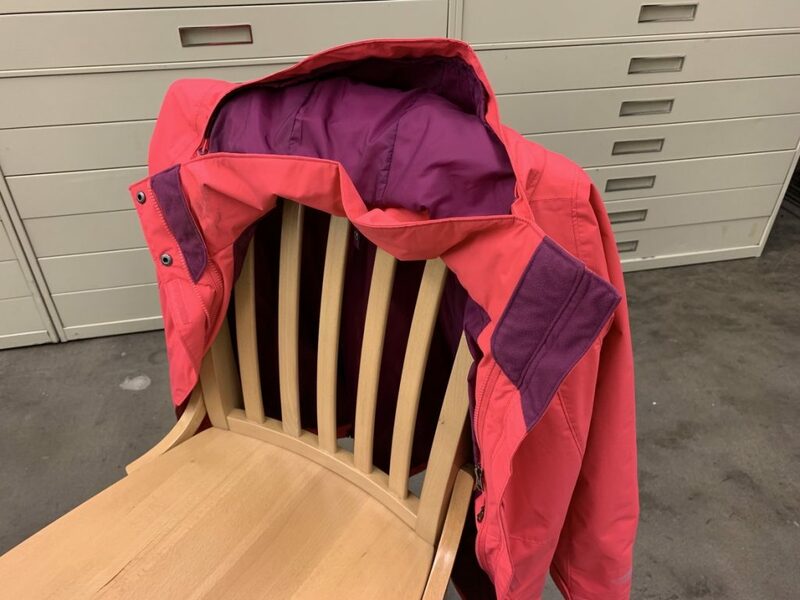 Did you leave a bright pink Columbia jacket with a purple interior behind during the Open House last Tuesday, March 26th? We had classes that day about Evernote, Religious Radicals, Ancestry.com and Online Family Trees that day. Call in, name the size, and we’ll set it aside for you. 503-963-1932. Where Should I Park for the GFO? 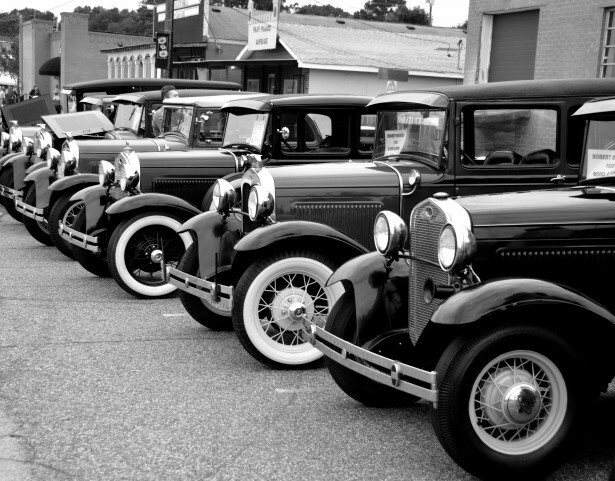 We know parking can be a hassle. (Welcome to Portland.) Here are your best options when coming to the GFO: A new lot has opened so we have three paid lots very close. Two are on 10th Avenue: At Division and ¼ block north of Division. These are all-day lots. These may be best for you. Park. Relax. Learn without worrying about expiring parking. The third is right behind our building off 11th ave. This allows 3-hour Maximum parking. You cannot return and feed the meter and stay longer. City Center Parking does not disclose how long you can park until you see the digital entry screen on the payment machine. They patrol and tow from those lots at all hours. Be careful to read the instructions. If you find a spot on the street, read signs carefully about maximum times allowed. WARNING: A number of spots on Division right next to the Ford Building become instant tow-away zones at 4pm during rush hour. If you have a disabled permit, you may park for an unlimited amount of time in any legal parking space marked 1 hour or more. (But towing restrictions apply at rush hour.) On Sunday only any legal street spot is not subject to any time limits. Join the Virginia Interest Group the first Saturday of each month (September-June) from 10:00 am – Noon. This month: The first of a two-part series on North Carolina. This session will focus on the history and settlement of North Carolina, beginning with the early explorers. Like Virginia, the geography of North Carolina influenced how the colony was settled. We will discuss the peoples who migrated into the colony: Moravians, Quakers, Germans, Scots, etc., why they were there and where they settled. Many of us whose ancestors were from these areas have a family story of a “Cherokee princess in our lineage so a discussion of the local Native Americans is also included. As time allows, there will be some discussion of specific records for these various groups. You can reach this group’s leaders, Judi Scott and Carol Currency, at Virginia@gfo.org. German Group 1 – 3 p.m. The Topics / die Themen: 1) An hour airier video of the state of Bavaria (Bayern), and 2) Bring a research problem and see if we can all help. The German Interest Group was formed in the spring of 2011. It is intended to be a source of information and inspiration for anyone with German speaking ancestors. One goal is to provide information on a variety of topics related to Germanic history and migration. We also will provide time for members to share their research journeys and connect with others who may be researching the same region or time period. Explore our manuscript, personal papers and Bible collection while we organize, scan and create finding aids. Drop by at the time that works for you. Questions? Send a note to manuscripts@gfo.org if you have questions! PMUG College 6 – 8 p.m.
Portland Mac Users Group College: 10 crucial questions about the Mac High Sierra and Mojave operating systems. Free for all GFO and PMUG members. For more information, visit their website. Wow! Just wow! We’re blown away by how many people are coming to the annual GFO Open House this week! 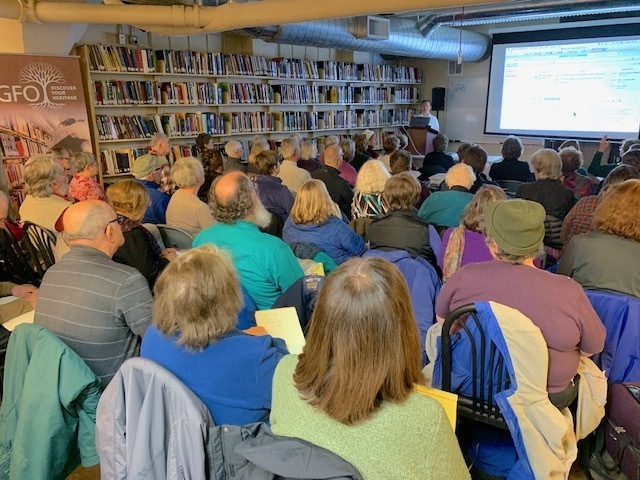 Irish Day kicked things off last weekend with our classroom jammed with enthusiastic genealogists. We thought attendance might drop during the week, but we were wrong! By the half way point more people had joined us than in all 9 days last year. By the time this email goes out, we still have 3 more days of classes left. 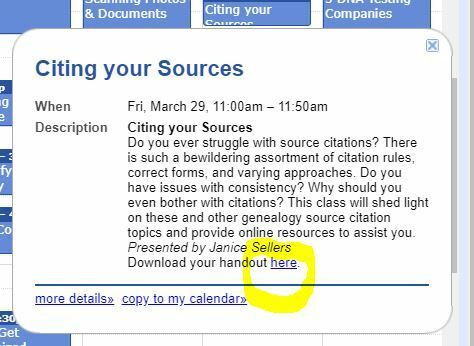 Friday, March 29 will include classes on Citing Sources, Mexican Ancestry, & Ohio River Area Research. Closing weekend, March 30 & 31 features DNA Days. Please come down! All of the classes are FREE and OPEN TO THE PUBLIC. Ingredients for a successful Open House: ▪ Great Speakers ▪ Free Access to Library ▪ Drool-inducing treats! Meet our Coffee Queen! 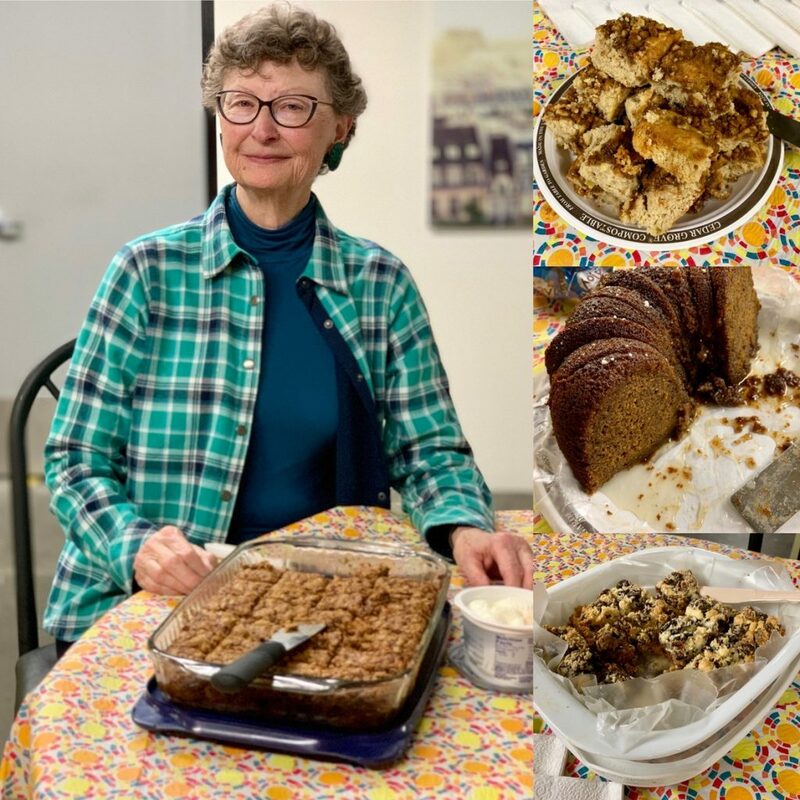 Judith Leppert comes every morning to our Open House this week to make fresh coffee and share her latest home-baked treats! Come see what she brings during the rest of this week through Sunday, March 31. Thank you, Judith! Military documents reported Patrick Powers as a native of Ireland who came to the US and then became a US citizen in 1892 by virtue of his US military service. His descendants knew nothing of his Irish roots or his family connections as his early death resulted in almost no verbal history for him. April’s Genealogy Problem Solvers presentation will demonstrate the use of a wide range of records in both the US and Ireland, including detailed examination of Catholic Parish records, Valuation Renewal Books, and Civil records. Utilizing these records, we will pinpoint Patrick’s birthplace, and identify some of his ancestors as well as additional kin. We will focus on how detailed examination of many records, the use of spreadsheets, a timeline, and even a distant DNA connection can contribute to finding the story of an elusive ancestor. Join us Saturday, April 20th, at 9:30 a.m. to learn how this technique can help you in organizing your research. For more information contact Katie Daly at GPS@gfo.org. Did you see the marvelous story about the GFO in the Oregonian? Tom Hallman, Oregonian’s Pulitzer winning feature writer, wrote about us on Sunday, March 24. Many people coming to the Open House say they learned about the GFO for the first time from this story. You can read it online here. The Hall of Fame Award is our way of honoring GFO members who have performed outstanding service to the Forum. The award is limited to one person per year, except in the case where a pair of members has worked together or the Board waives the limitation. 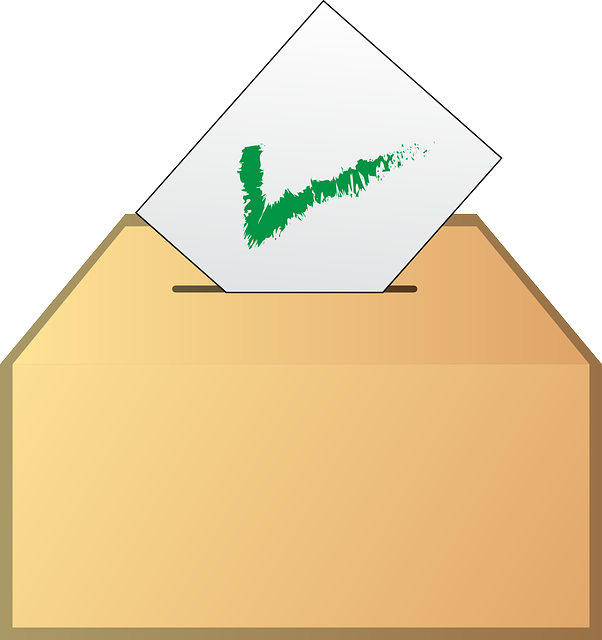 A nomination may be made by any Forum member and the recipient will be selected from the panel of nominations by a majority vote of the Board of Directors. The recipient must have a well-documented history of… * Service * Leadership * Accomplishment …in more than one facet of the Forum over a significant period of time. Please include examples of how this nominee fulfilled all three categories. Any current GFO Member may nominate a member for the Hall of Fame. Please send nominations to secretary@gfo.org before May 1st. 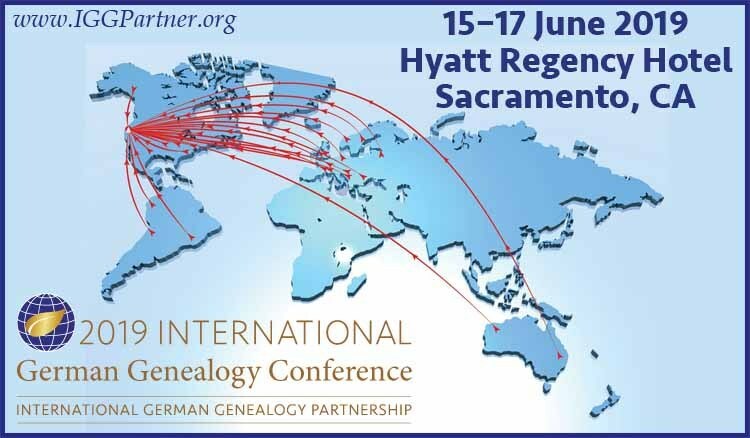 Beginning on Saturday, June 15, 2019, Sacramento will host the second international conference of the International German Genealogy Partnership (IGGP). More than 700 people are expected to attend the conference to focus on the history and genealogy of those with German ancestry, wherever they live in the world. Regular pricing ends April 15th. Don’t forget to sign up soon! We Regret the Error… We apologize for a typo in the Financial Report in our most recent Forum Insider. The GFO posted a gain in February of $5,388.24, not a loss. OPEN HOUSE – Citing Sources, Mexican Ancestry, & Ohio River Area Research 11 a.m. – 4 p.m.
See the full detailed class list here. OPEN HOUSE – DNA Days! 9 a.m. – 4:45 p.m.
Two sessions with guest speaker Barbara Rae-Venter are sold out: Saturday at 1:30 p.m. and Sunday at 9 a.m.
All others are open on walk-in basis until the room is full. Please also be sure to check our Open House website. Free First Monday! 9:30 a.m. – 8 p.m. Please note! We’re open late (until 8 p.m.) for this month’s Free First Monday. Stop by after work! 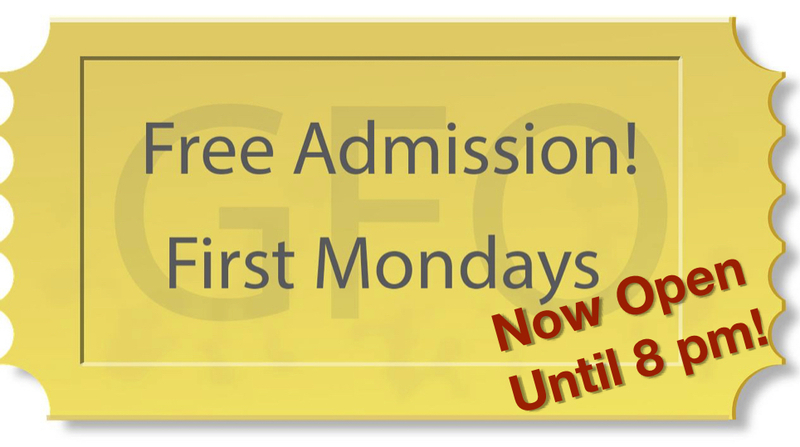 Come visit our research library each first Monday of every month and splurge on all GFO’s wonderful resources for FREE. 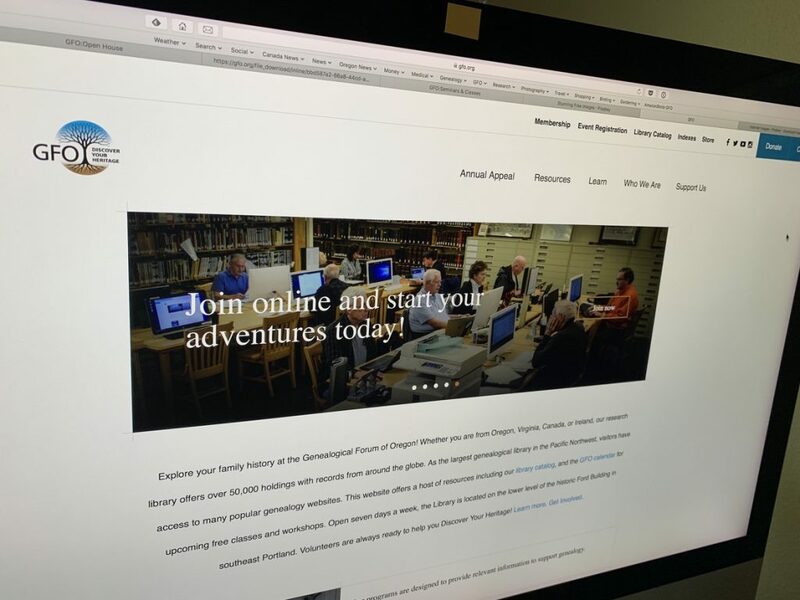 Explore our online databases like Fold3, Ancestry World Library Edition, Newspapers.com, and many more. Our analog and microfilm collections total over 50,000 items. Don’t miss out! Library Open Late Until 8 p.m.
At Learn & Chat some of the learning comes from speakers with particular expertise but most of it comes from the sharing of experiences and knowledge of attendees who have developed methods that work for them. And if you have been doing genealogy for any length time you have likely experienced the wonderful moments of exhilaration, the successes that you then share with others and that drive you to continue researching. Unfortunately those times can be few and far between. Join us to talk about your genealogy questions and help provide support to others. Facilitated by Jeanne Quan. DNA Q&A 1 – 3 p.m.
Lisa McCullough will be available to help answer your DNA questions, whether you are new and just getting started or have more involved questions. Questions? Email the facilitators dna_qa@gfo.org. GFO’s Annual Open House Begins This Weekend! Have you ever wanted to attend a genealogy conference but couldn’t afford to? Now you can! Please join us at the GFO for its biggest event of the year! Nine days of classes are FREE and OPEN TO THE PUBLIC. 33 classes are open on a walk-in basis. The 4 presentations requiring registration are completely full. We have a few theme days. Saturday, March 23 kicks off with Irish Day. Wednesday, March 27 is Finding Family Day. Tracking living relatives? Birth parents? This is the day for you. Closing weekend, March 30-31 features DNA Days. 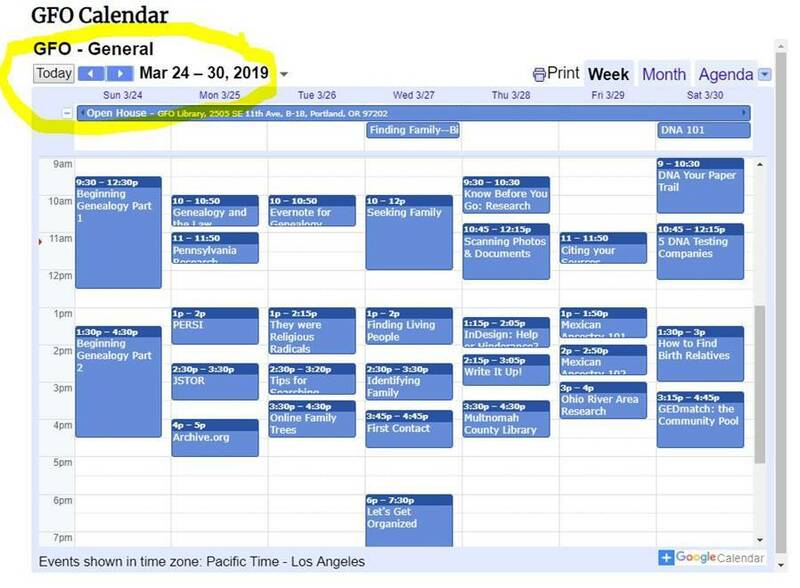 Click on the “Class Descriptions” link above, or view our Calendar page for a complete list of subjects and class times so you don’t miss a single moment. We guarantee you’ll learn something new and exciting about the wonderful world of genealogy! 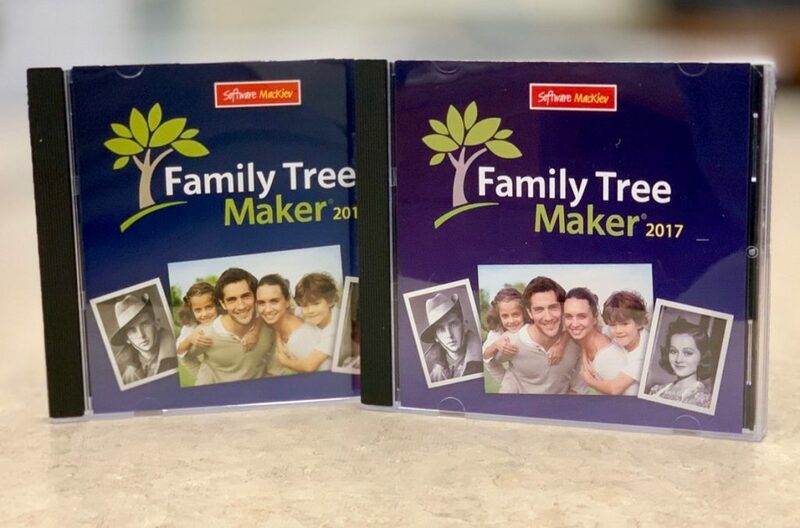 2 Copies of Family Tree Maker in Open House Raffle! Coming to our Open House? Bring a little cash to spare. You could win one of two copies of Family Tree Maker software! Each is valued at $89.95. $1 for 1 ticket. $5 for 6 tickets. Exact change is appreciated! You do not have to be present to win. But be sure to write your name and phone number on the raffle ticket you leave in our box. The drawings will be at the end of the Open House, March 31. And some of your comments included . . . ▪ Can’t wait! ▪ Wish I could do genealogy every day. ▪ Lots of choices. Looks well planned. Thanks. ▪ I’m excited to come to the presentations! ▪ Thank you so much for offering this opportunity for me to expand my knowledge of a variety of subjects. Along with the chance to meet new people and perhaps even make a cousin connection, you never know. ▪ It’s the best event of the year! ▪ Thanks for making this happen. Now please take this week’s survey! We’d love to know which Open House classes look the most interesting to you. Anne is a dedicated, regular Sunday volunteer who usually beats everyone else into the library. Among other things she is a pro at locating misplaced books, earning her the name of “Finder of Lost Things.” Amazingly, she has volunteered at the library every Sunday but one for over three years. Anne is always willing to help where needed and even stepped up to serve as Director at Large when asked. She has also served on the Disaster Preparedness and Grants Committees. We are pleased to present her with this honor for her long and distinguished service at the GFO. E-News Coordinator Needed by May 1st!! Our E-News Coordinator is retiring after April 31st this year and we need your help to fill the impending vacancy. ▪ Do you love gathering genealogy news items and distributing them to the world? ▪ Are you tech savvy-ish and above all a stickler for details? ▪ Do you have 1-3 hours you can donate each week to a wonderful cause? ▪ Is finding fun, vintage, and public domain images via google searches your favorite pastime? Training is available from April 1st through April 30th. 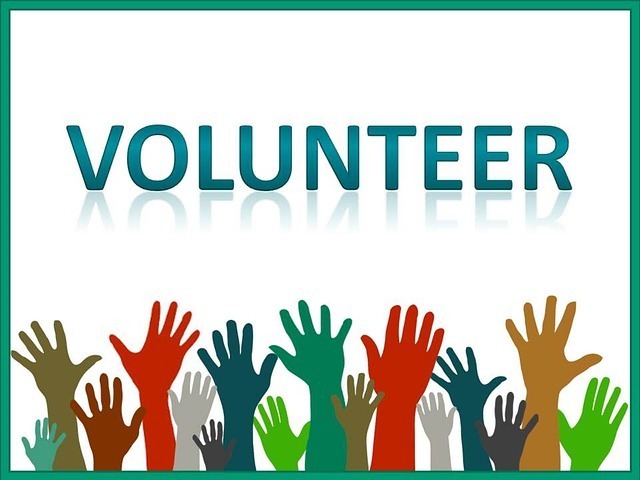 Email news@gfo.org if you have interest in filling this extremely valuable volunteer spot. 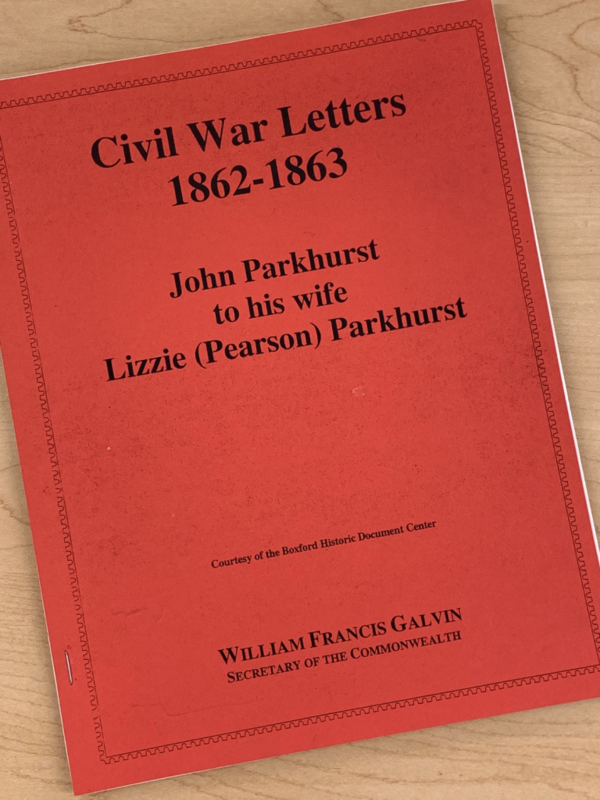 During the Civil War in 1862 and 1963, John Parkurst wrote 55 letters to his wife, Lizzie (Pearson) Parkhurst, in Chelmsford, Massachusetts. 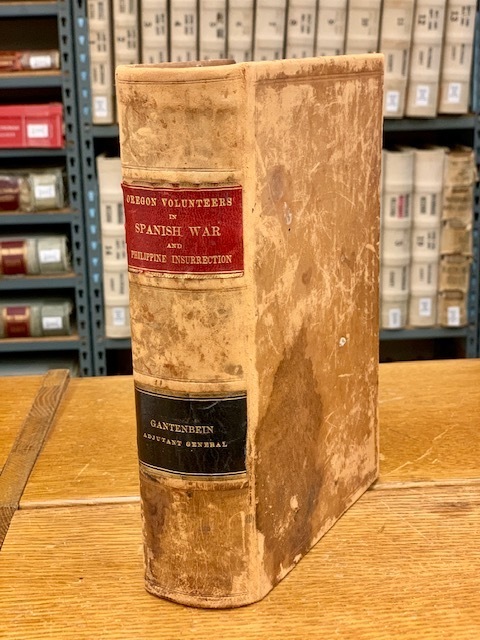 The Massachusetts Archives calls these “one of the most compelling personal accounts of a soldier’s life during the Civil War anywhere.” “I was a little seasick this morning bu am better now. We live on hard crackers and boiled ham & water.” The letters not only relate his experiences, but frequently refer to his children, parents, and their lives. Fair warning: these letters are unvarnished and reveal great prejudice against African Americans. This reprint of the transcribed letters is available for purchase from the GFO Bookstore for $5.00. Contact booksales@gfo.org if you are interested. Beginning Genealogy 9:30 a.m. – 4:30 p.m. This class session is sold out. OPEN HOUSE – Discover Your Irish Roots 10 a.m. – 3:20 p.m.
OPEN HOUSE – Beginning Genealogy 9:30 a.m. – 4:30 p.m.
OPEN HOUSE – Legalities, Pennsylvania, & Online Resources 10 a.m. – 5 p.m.
OPEN HOUSE – Evernote, Religious Radicals, Ancestry.com, & Online Family Trees 10 a.m. – 4:30 p.m.
OPEN HOUSE – Family Connections & Biological Connections 10 a.m. – 7:30 p.m.
OPEN HOUSE – Multnomah County Library Resources, Write It Up, Trip Planning, & Software Advice 9:30 a.m. – 4:30 p.m.
OPEN HOUSE – DNA Focus Days! 9 a.m. – 4:45 p.m.
Two sessions with guest speaker Barbara Rae-Venter are sold out. All others are open on walk-in basis. I wanted to let you know the addition of three census record collections from Norway! The records will be available at www.myheritage.com/norway-census. The censuses, from 1891, 1900, and 1910 contain 6.8 million records and provide a treasure trove of information for anyone with Norwegian heritage. Users with family trees on MyHeritage will benefit from Record Matching technology that automatically reveals new information about their ancestors who appear in these records. MyHeritage has worked on digitizing these collections in partnership with the National Archives of Norway (Arkivverket). With the release of these new collections, MyHeritage now offers approximately 34 million historical records from Norway, including census, baptism, marriage, and burial records. As the Scandinavian market leader for family history research and DNA testing, MyHeritage also offers 136 million records from neighboring Sweden and 105 million records from Denmark. MyHeritage is the only major genealogy company to provide its services and full customer support in all three Scandinavian languages, as well as in Finnish, and offers the greatest potential for new family history discoveries for anyone with Scandinavian origins. 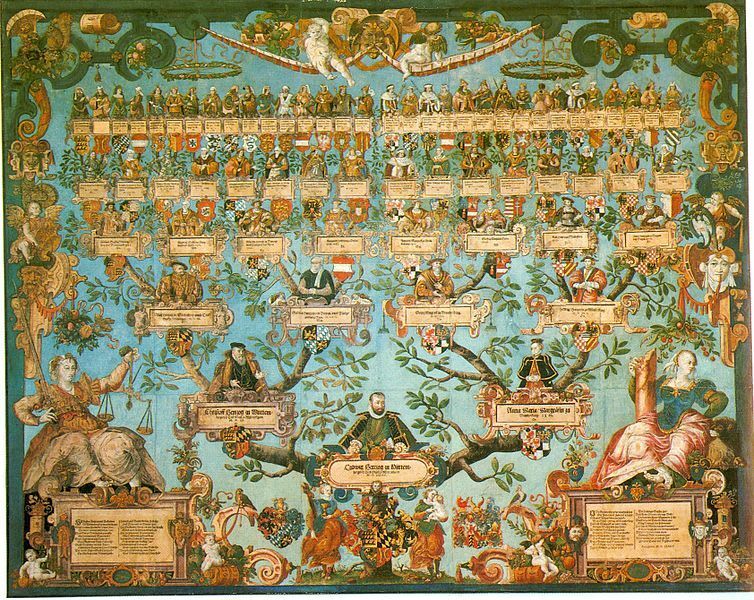 It also has the largest user base in Scandinavia and the largest collection of Scandinavian family trees. The three new collections are now available on SuperSearch™, MyHeritage’s search engine for its 9.6 billion historical records. 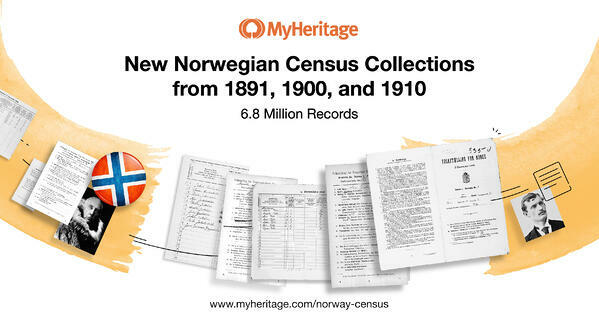 Searching the Norway census collections is free. A subscription is required to view the full records and to access Record Matches. Tel Aviv, Israel & Lehi, Utah — MyHeritage, the leading global service for family history and DNA testing, announced today the publication of three census collections from Norway, from 1891, 1900, and 1910. MyHeritage has worked on digitizing these collections in partnership with the National Archives of Norway (Arkivverket). The collections provide robust coverage for Norway’s entire population during a span of two decades and include valuable family history information. While some former Norway censuses were conducted only in select trading centers, these records are more comprehensive. The 6.8 million new records document names, households, dates of birth, marital status, relationships, and residential conditions, making them vital for anyone wishing to explore their Norwegian origins. Their publication marks the first time that Norwegian record collections of such high quality and granularity are available online. Norwegian privacy laws restrict public access to census data for 100 years. Consequently, the 1910 census is the most recent one available to the public. This collection stands out as the first census conducted following the dissolution of Norway’s union with Sweden in 1905. It is also the first Norway census to record full birth dates, rather than only birth years. Are you a GFO Member? Please join us for the General Membership meeting this Saturday from 2 – 2:15 p.m., immediately followed by our free March GenTalk. At the Membership meeting, find out who’s running for office, nominate someone (with their prior permission), or even throw your hat in the ring. What’s the GenTalk topic this month? Following American Migrations: The First 100 Years by Tricia Oberndorf From the end of the Revolutionary War through the 19th century, Americans and immigrants moved westward from the eastern seaboard to the interior and ultimately to the far west coast. This presentation will discuss who moved westward, the reasons why they moved, the routes they may have taken, and the things you may discover for them along the way. Tricia Oberndorf has been engaged in genealogy research for 30 years, the last six years professionally. Her research has spanned most of the United States, from the colonial period to the 20th century. Her ancestors were not ones to stay in one place very long, prompting her to learn about U.S. migration. Living in Columbia County, Oregon, she has also become engaged in local history and research there, volunteering with the Columbia County Historical Museum. Please be sure to send your nominations to secretary@gfo.org before May 1st! 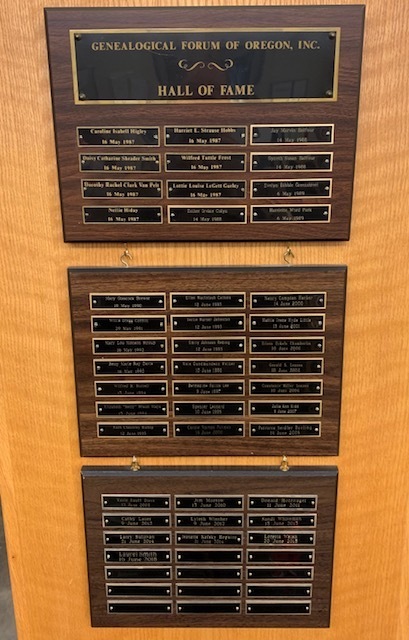 The Hall of Fame Award is our way of honoring GFO members who have performed outstanding service to the Forum. The award is limited to one person per year, except in the case where a pair of members has worked together or the Board waives the limitation. A nomination may be made by any Forum member and the recipient will be selected from the panel of nominations by a majority vote of the Board of Directors. The recipient must have a well-documented history of service, leadership and accomplishment in more than one facet of the Forum over a significant period of time. Please include examples of how this nominee fulfilled all three categories. This Week’s Survey: Open House! Our biggest event of the year is a little over a week away. .
We’d love to know if you’re planning to attend! 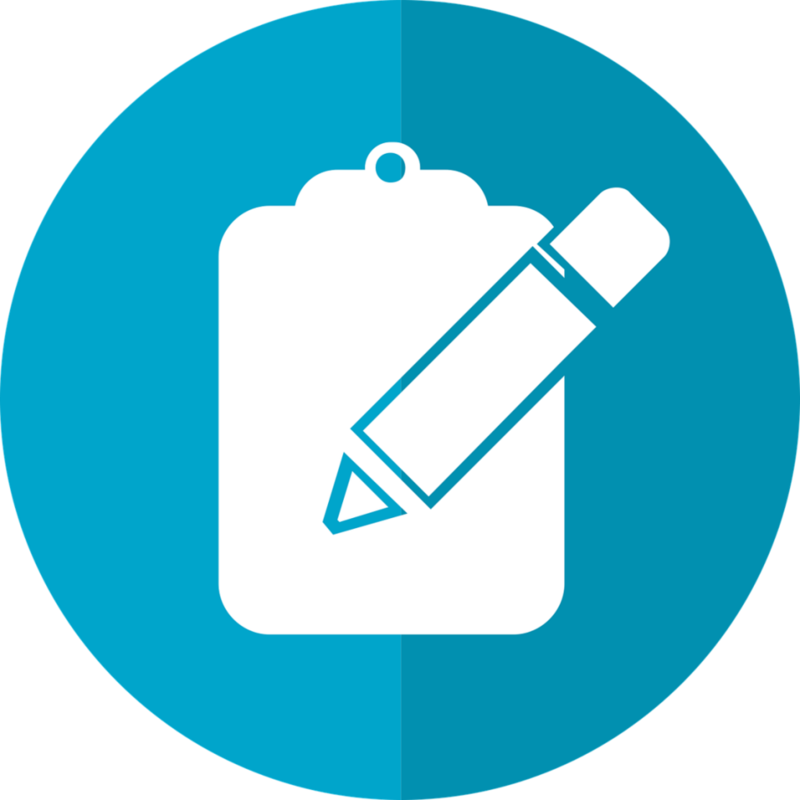 Please let us know if we should expect you by taking our survey. Handouts for the Open House are available online! Download the class notes for the presentations you plan to attend. Print them or not depending on your preference. Review them before attending. Bring them with you when you come for the class. Step 1. Visit GFO’s online calendar. View by week for better detail. Step 2. Scroll to the week of GFO’s Open House. Step 3. Click on the class you want to attend and click on the link to download. We hope to see you at many of our upcoming, completely FREE Open House events, beginning in less than 10 days! GFO’s Irish Special Interest Group is busy this month! 1. The All Ireland Cultural Society (AICS) has a St. Patrick’s Day Celebration and invited the GFO to have a table there. As the Irish SIG, we plan to have someone join GFO president, Vince Patton, to help spread the word about our group and extend an invitation to join us in researching our Irish ancestors. * 1. We have a program for our meeting on April 17. Jennefer White contacted us through the GFO website asking for help with a brick wall. She did a very nice job of sharing with us what she knows, and where she has looked for information. Before the April meeting we will share her information. What a great opportunity for us to brainstorm and learn from each other about strategies and resources. Perhaps we can help her breakdown that wall! * 1. At our last meeting Tom O’Brien let us know that he must step down from the Corresponding Secretary position. We are looking for someone to volunteer to take over that position from him. The primary duties are to maintain the email list of members of our group in a computer format. Tom has shared his file with us. Then, when meeting reminders need to go out, or if someone else has an announcement (ex. when we share Jennefer White’s brick wall info), the secretary sends it out to our members. If you might be interested, or have any questions, please let us know by contacting us by email at Irish@gfo.org. Happy St. Patrick’s Day to all. If you know someone with deep California roots back to the Gold Rush era, pass this on! 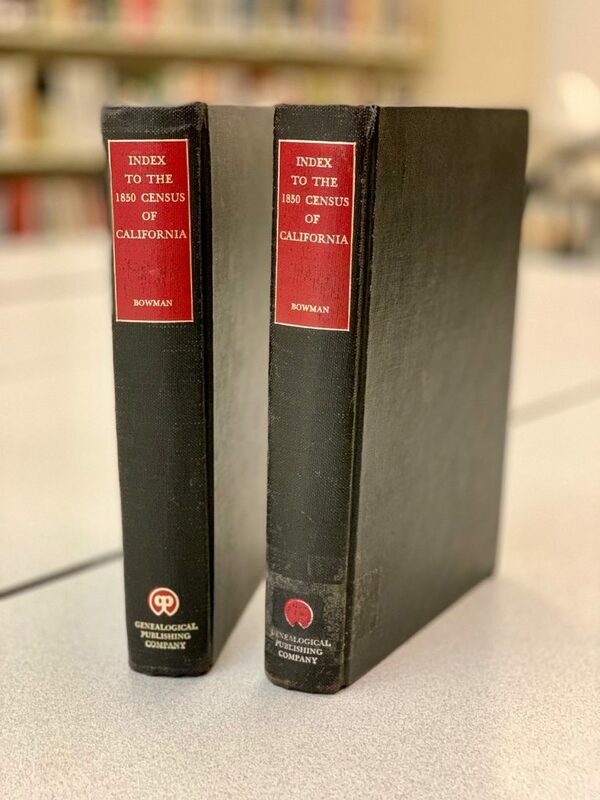 We have not just one, but two copies of this book to spare: Index to the 1850 Census of California. Both were published by Genealogical Publishing Company in 1972 and are in good condition. You can have either one for $24 per book. Contact booksales@gfo.org if interested. Urgent call for a Webmaster! Our wonderful GFO Webmaster, Maggie McNair, must step away from this important role. Do you have website experience? We Need You! Fortunately, our website service already provides a stable template so the design is already set, and our CMS is user friendly. However, we have a deep website with many searchable records and we need someone to help keep the site updated. Please contact president@gfo.org if you have the skills and some spare time to offer us. This is a volunteer position. In fact, the GFO is all-volunteer. We have no paid staff of any kind. Thank you, Maggie, for all your work on the website over the last few years! Our recent inventory revealed a troubling statistic: 193 books are missing from our library. Collectively, these are worth thousands of dollars and many cannot be replaced. Might you have one at home that you perhaps forgot to return? Please check your home, car, etc., and help us find our missing books. If you find a GFO book, please return it, no questions asked. 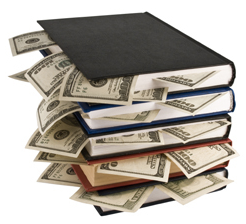 If it was checked out, we will waive overdue fees on books returned by March 31st. 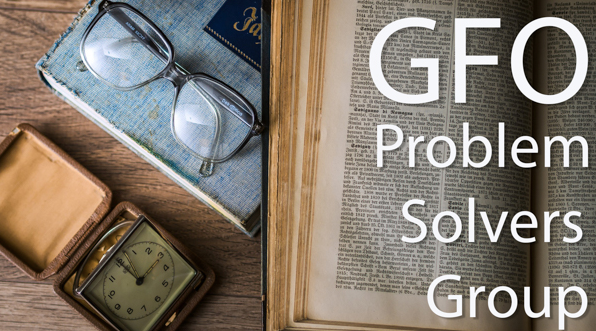 This week at GFO ..
Genealogy Problem Solvers 9:30 a.m. – 11:30 a.m.
William P Smith, Farmer, Klondike gold prospector, college trustee, acquaintance of President Hubert Hoover, Quaker, and soldier, who were his parents? And, how did a good Quaker wind-up carrying a musket for General Sherman? How was he connected to the Quaker marriage certificate for Benjamin Smith and Elizabeth Pearson found in his granddaughter’s effects? Come find out how the answers to these questions and more were found in War Department records. Beginners and intermediate researchers are encouraged to submit problems to work on. For more information contact Katie Daly at GPS@gfo.org. African American Ancestry Group 12 – 2 p.m.
Freedmen’s Bureau records are overlooked by far too many researchers. The records have not been the easiest to work with, but now that they are online and indexed, they can yield a wealth of information more easily. These documents can include marriage dates, children’s birth dates, school records, work contracts, and, most importantly, the name of an applicant’s most recent slave holder. Learn why these records can be key to finding out more about your family. If you know of any other people interested in African American genealogy, tell them about the group. You do not have to be a GFO member to participate! For more information, contact us at African_American@gfo.org. General Membership Meeting 2 – 2:15 p.m.
Find out who’s running for office, nominate someone (with their prior permission), throw your hat in the ring, and be on hand for the GenTalk to follow. 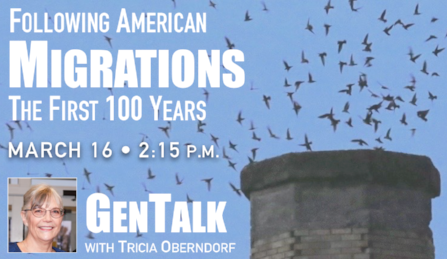 GenTalk: Following American Migrations: The First 100 Years 2:15 – 3:15 p.m.
From the end of the Revolutionary War through the 19th century, Americans and immigrants moved westward from the eastern seaboard to the interior and ultimately to the far west coast. This presentation will discuss who moved westward, the reasons why they moved, the routes they may have taken, and the things you may discover for them along the way. Tricia Oberndorf has been engaged in genealogy research for 30 years, the last six years professionally. Her research has spanned most of the United States, from the colonial period to the 20th century. Her ancestors were not ones to stay in one place very long, prompting her to learn about U.S. migration. Living in Columbia County, Oregon, she has also become engaged in local history and research there, volunteering with the Columbia County Historical Museum. Family Tree Maker Users’ Group 1 – 3 p.m.
Join other users who want to work through the 2017 Companion Guide to Family TreeMaker. Bring your laptop with 2017 version of FTM installed and an empty usb thumb drive. Facilitated by Joyce Grant-Worley. Send Joyce a question at FTM@gfo.org. French Canada Group 3:30 – 5 p.m. Sharing stories of our history. 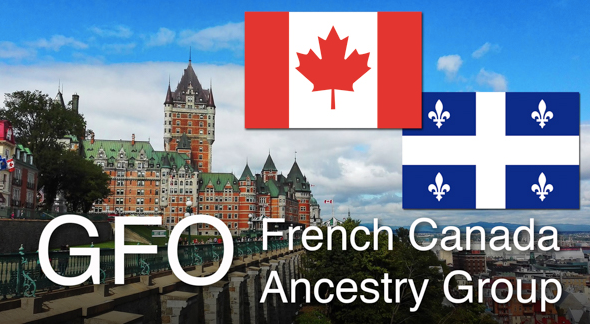 Come and join this group to learn more about French Canadian ancestry and Acadia. The group leader is Bob LaMarche. Send him a note at FrCan@gfo.org. At Learn & Chat some of the learning comes from speakers with particular expertise but most of it comes from the sharing of experiences and knowledge of attendees who have developed methods that work for them. And if you have been doing genealogy for any length time you have likely experienced the wonderful moments of exhilaration, the successes that you then share with others and that drive you to continue researching. Unfortunately those times can be few and far between. Join us to talk about your genealogy questions and help provide support to others. Facilitated by Jean Quan and Sandy Alto, who can both be reached at learnandchat@gfo.org. Lisa McCullough leads a discussion on various DNA related subjects, with each meeting focused on a particular subject. General questions are welcome at the end of each planned discussion. Questions?Please email Lisa at dna_lm@gfo.org. Also, don’t miss the current issue of The Forum Insider During inclement weather this winter, please be sure to check our Facebook Page, website, or local TV & Newspaper closure web pages to see if we’re open! Or, call the library at 503-963-1932 to insure someone is here. 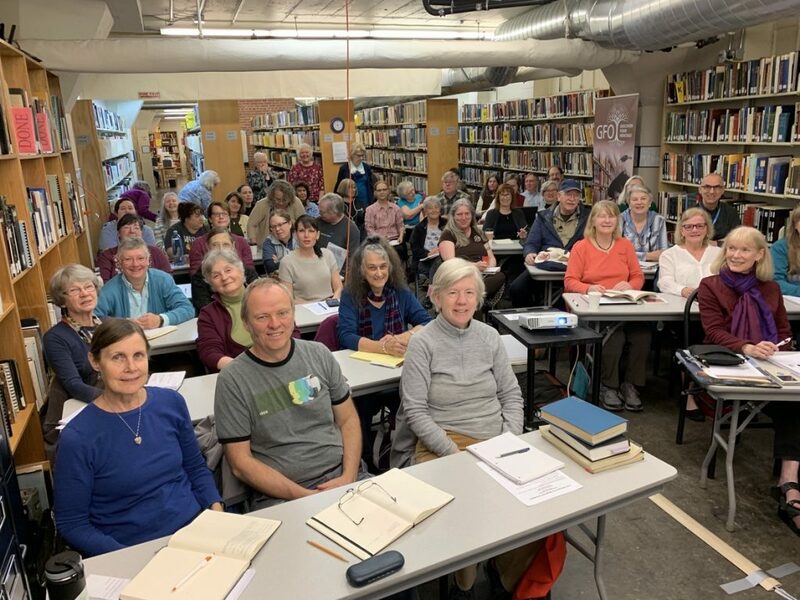 Our Beginning Genealogy class on March 24th filled up so quickly (and so did the wait list) that we’ve decided to add an additional opportunity to attend—on March 22nd—the day before GFO’s Open House officially begins. Those of you who are registered for March 24th are welcome to change days if Friday would be more convenient to your schedule. We recommend you register for March 22nd first, then cancel your registration on the 24th to open the space to other attendees. Registration closes on March 19th at 11:59 p.m. (23.59 on the 24 hour clock!). After registration closes, please notify Laurel if you cannot attend so someone on the Wait List can be added. GFO’s African American ancestry group is moving its meetings to a new time slot. Look for them on the third Saturday of each month from Noon to 2 p.m. We welcome everyone who might have African American ancestry themselves or whose ancestors’ lives intersected with Black Americans. All our special interest group meetings are free and open to the public at the GFO Library. 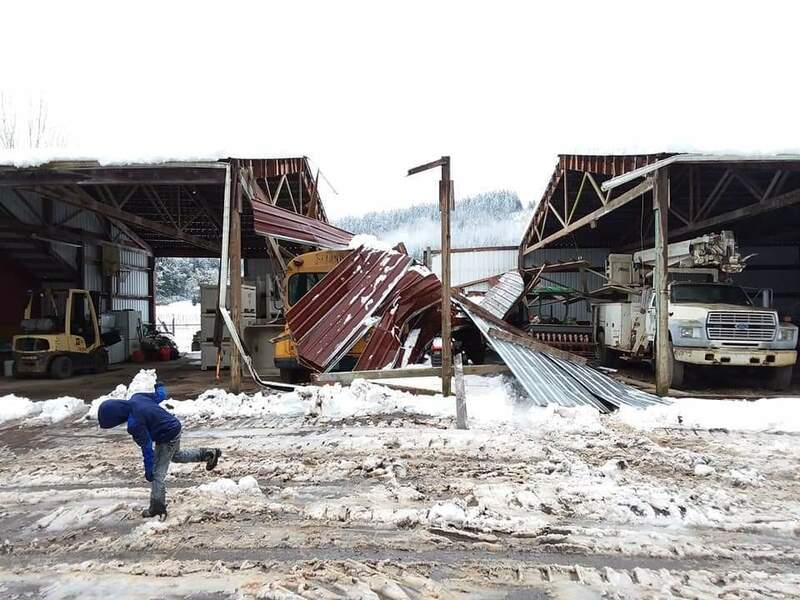 Heavy snow crushed a building on Debra Koehler’s farm. Photo: Debra Koehler. A strong winter storm in Oregon’s southern coast range has forced GFO member Debra Koehler to live like her pioneer ancestors. Debra lives on a farm in near Elkton where she’s likely to be without power for a full month. 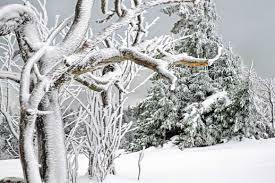 Heavy snows toppled many large trees causing damage so severe to electric lines that the local co-op says it has to rebuild entire sections on remote hillsides. After eight days without power, Debra and her neighbors landed on the news and the Oregon National Guard responded with additional resources. Debra says it’s like living in the 1920s. She told KGW-TV, “You develop a huge respect for the pioneer ancestors who got through entire winters you know, I’m hoping to get through three weeks without power they got through entire winters.” Access the full story here. Our hearts go out to Debra and all her neighbors. We’d like to thank everyone who came to the library to make two Family Tree Maker presentations a tremendous success! On March 6, more than 100 people turned out to hear from the folks behind this popular software. We even got some sneak peeks of features coming in the future. Family Tree Maker graciously offered a few copies of their software to us to give away. Look for those at the raffle table at the Spring Seminar on April 27! Also, don’t forget that the GFO has two Family Tree Maker special interest groups that meet regularly. GFO will now have the Irish Roots magazine available at our library for the next two years courtesy of the Irish Special Interest Group (SIG). The group took up a collection recently specifically to make this wonderful donation. GFO’s library now has a full 24-month subscription to the Irish Roots magazine. Thank you to the members of the Irish SIG for their generous donation! It is with great reluctance we must end the practice of GFO members giving their Office Depot Rewards benefits to the GFO. In the past, you could give our phone number to make sure we got credit for your purchase. Unfortunately, Office Depot trained all their employees to then look at the account and offer dollars accrued to be used on the spot. As a result, a number of GFO members inadvertently spent our dollars on their personal purchases. 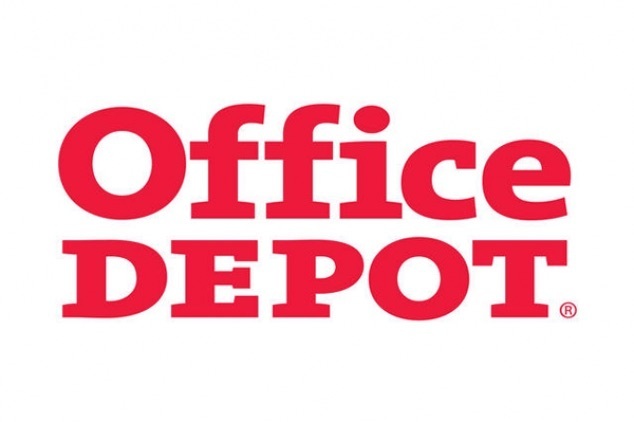 Since Office Depot has no way to change the design of their program, we are discontinuing this program which has provided benefits to us in the past. Clarification Notice… We confirmed from this event’s leaders that no registration is needed to attend. They also do not have a website this year for the event. Questions? Please email rootsquest@solidbluecircle.com. Come to the GFO table this St. Patrick’s Day! 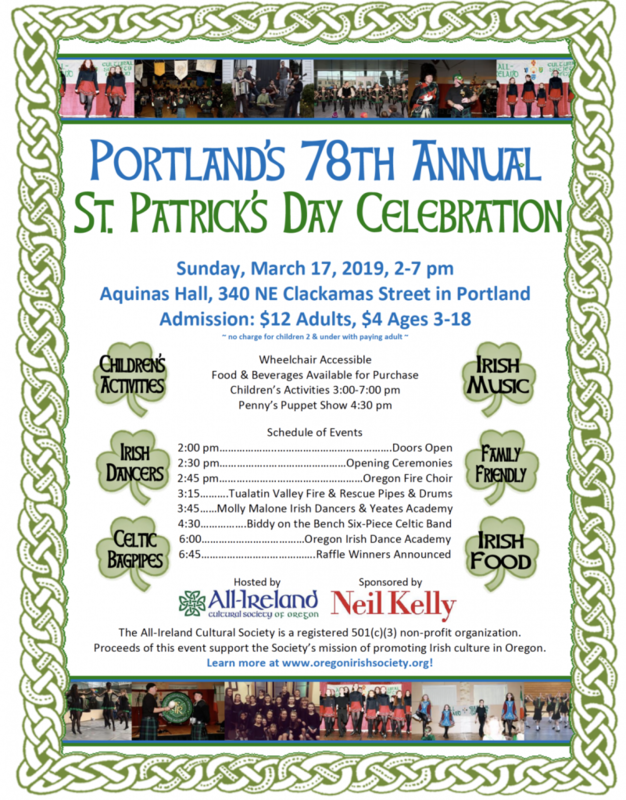 All the details about Portland’s 78th Annual St. Patrick’s Day Celebration can be found at their website. Be sure to visit the GFO table at this event. We’d love to meet and chat with you about all things Irish! 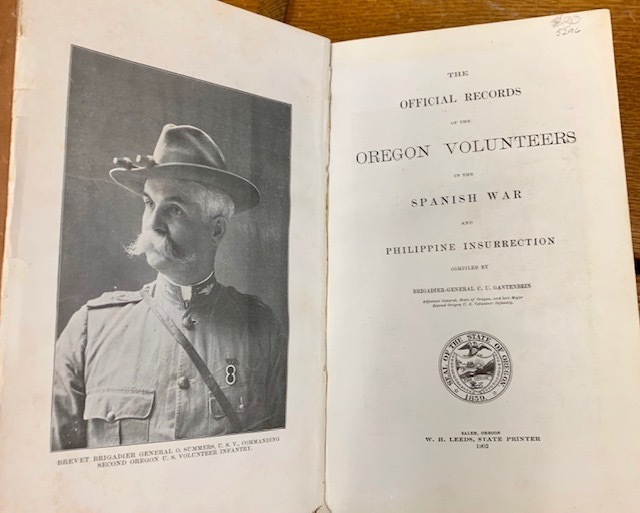 This week the GFO Bookstore features The Official Records of the Oregon Volunteers in the Spanish War and Philippine Insurrection. This original 1902 book was compiled by Brigadier-General C.U. Gantenbein. It is in good condition for its age, though the title page shows separation from the binding. Sale price: $30. Contact booksales@gfo.org if you’d like to buy it. Last week’s survey asked What was your favorite article in the March 2019 Bulletin. 50% of respondents selected Tracing the Andrew Göltl and Mary Kögel Family as their favorite article in the March Bulletin. Don’t miss out. Read the Bulletin and you can still respond to the reader survey. Beginning and intermediate researchers are welcome. Some subjects will include online parish records, Hispanic genealogy societies, Family History Library/FamilySearch.org, Ancestry.com, solving genealogical problems, methodology of organizing your research, etc. Of course this group will also be about sharing our research experiences, and having fun. If you know of any other people interested in Hispanic genealogy tell them about the up and coming group. They don’t have to be a GFO member to participate. For questions or comments, please email Vince at sw@gfo.org. Great Lakes Region 9:30 – 11:30 a.m.
We all learned about the Erie Canal back in 6th grade. But what do we know about how it affected the experiences of our Great Lakes Region ancestors? The Canal enticed immigrants, settlers, and workers with the promise of better lives, and interestingly, it transported more than just people and goods. We will also take a quick look at some lesser-known ways to use the Family Search website and have time to share our genealogy brick walls and success stories. If your ancestors were in Illinois, Indiana, Michigan, Minnesota, New York, Ohio, Pennsylvania, Wisconsin, or Ontario CANADA, or if you just want to hear about this interesting time in US history, you are most welcome. Interest in the Great Lakes Region can be broad and diverse, as some ancestors settled and remained there for generations, while others spent a short time there before moving on. The group’s interests include migration, travel, trade, historical events, and research techniques specific to the area. For more information contact Lynn Rossing at GreatLakes@gfo.org. 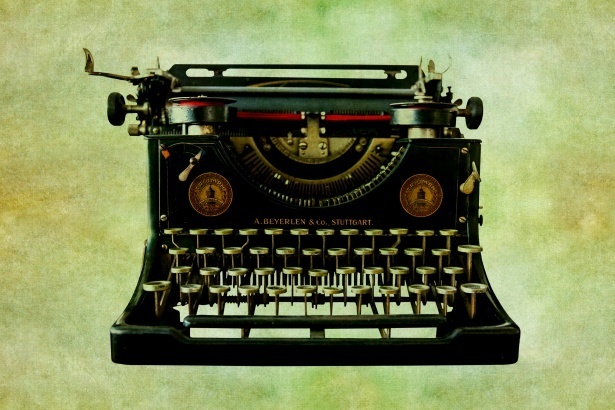 Writers’ Forum 1 – 3 p.m. This is a peer group of genealogists, who meet to learn about writing and to share our writing with each other. Peggy Baldwin facilitates this group and can be reached writers@gfo.org. GFO Board Meeting 6:10 p.m. – 8:10 p.m.
PMUG College: Photo Management 6 – 8 p.m.
Photo management on the iPad, iTouch, and iPhone. We will examine apps that make editing your photos in iOS a breeze. Many of these are free, including Apple’s versatile Photos program. Also explore apps that are recommended by PMUG members and other consultants. Why dig through the App Store for useful apps when you can choose from our tried and true recommendations. Come join the Portland Mac Users Group for this PMUG College class. Free to GFO and PMUG members. To register: Call 503-228-1779 or email: college@pmug.org. NEW! Free First Monday Hours Extend to 8 O’clock! We’re making it just a bit easier to see everything the GFO Library has to offer. The First Monday of each month has long been free to everyone. For the next three months, we are extending our hours until 8 p.m. that day so you can come after work or when parking space may be easier to find. So, on March 4th, April 1st, and May 6th, come stay late with us! And please, be sure to share this with friends who are not members of the GFO. Are you ready for this year’s Open House at GFO? Check out the full 9-day Open House schedule here! Barbara Rae-Venter. Photo by Brian L. Frank. You have a chance to hear directly from the genetic genealogist who cracked the Golden State Killer case. Barbara Rae-Venter is coming to speak at the GFO during our DNA Days. On Saturday, March 30th, she will talk in the afternoon about DNA genealogy research techniques. On the morning of Sunday, March 31st, she’ll speak about the Golden State Killer case itself. This will be popular so you must register for these limited seats. Registration for Barbara’s sessions opens on Friday, March 1st at 9:00 a.m., at our website. 67 seats are available for each session. Do not wait to sign up. They will fill fast. Many thanks to Emily Aulicino for arranging this rare opportunity. Barbara’s sleuthing has been profiled in the New YorkTimes and she was named one of the 10 People Who Mattered most in 2018 by Nature magazine. Also, Laurel Smith’s all-day Beginning Genealogy class on March 24 requires advance registration. 30 seats are available. This registration also opens Friday, March 1 at 9:00 a.m. at the same web link above. Have you read GFO’s most recent Bulletin yet? Inquisitive Bulletin editors want to know … What was your favorite article in the March 2019 Bulletin? If you haven’t looked at the March issue of The Bulletin yet, well, now’s the time! Please click on the link above to cast your vote. Results will be shared in next week’s E-News. If you’re not yet a current GFO member, you can get a free copy of the March issue of The Bulletin, on the house! Simply click the blue button link directly below. * Oregon Obituaries 1958 – 1962 (newspaper clippings) indexed: Some 1907-1952. * Newspaper Clippings – 1937, 1938, and 1939: Mostly obituaries, but some anniversaries and family reunions. 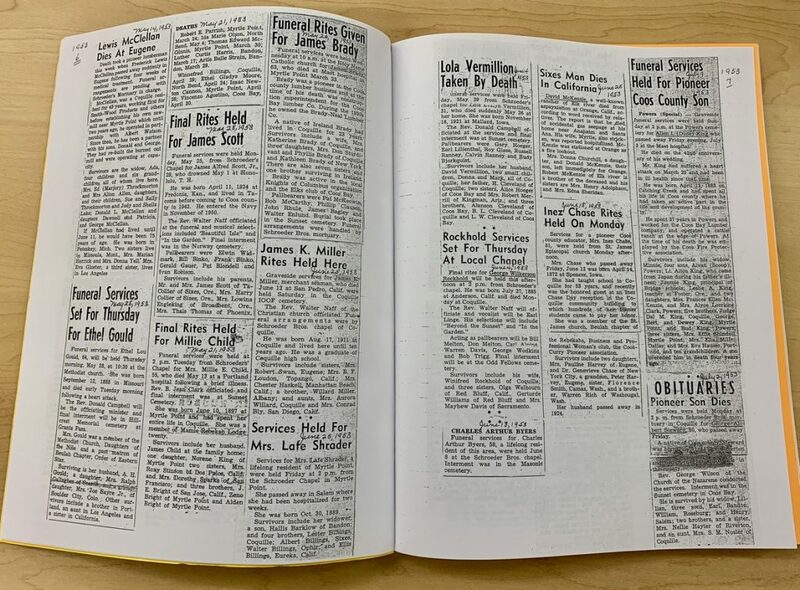 * Southwest Oregon obituaries from 1953-1958. 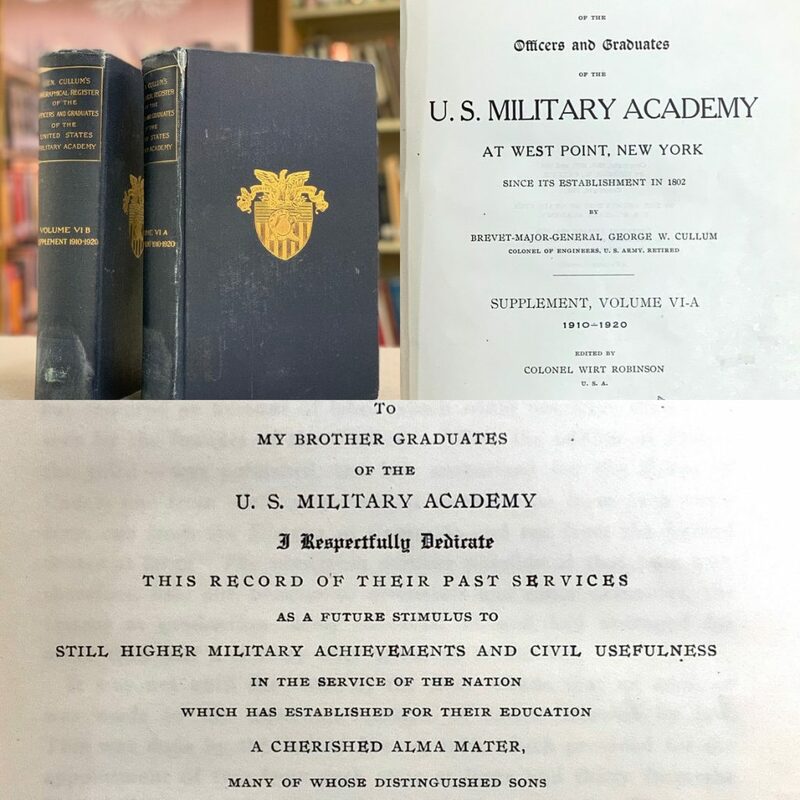 * West Point Assembly obituaries of graduates of USMA: scans from 1968, 1969, 1984, 1986. We’ve been preserving heritage since 1946 and the job never ends. Come check out our perpetually improving collections at the GFO Library. This week’s surplus book of the week is an original printed in 1892. 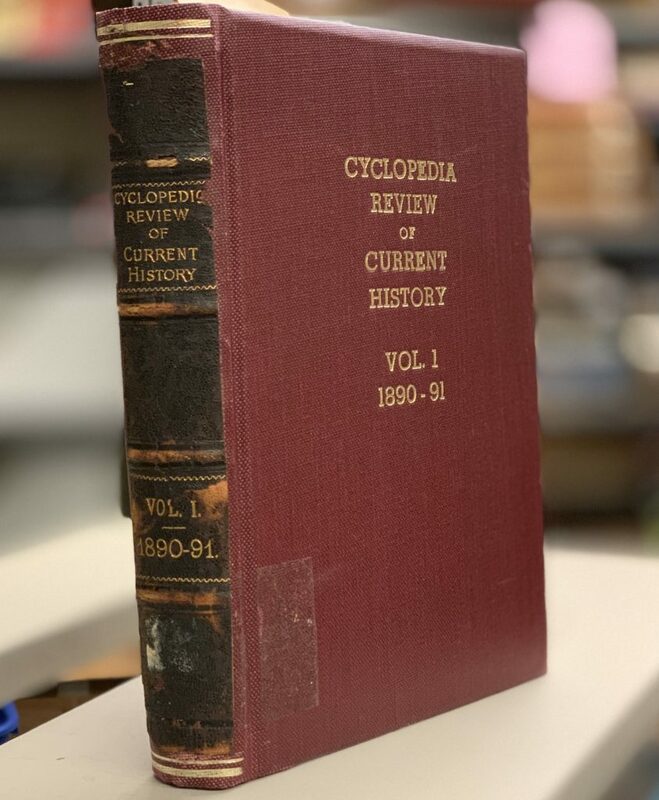 The Cyclopedia Review of Current History, Vol. I, 1890-91 could provide you valuable historical context for your writing or research in this era. It covers both U.S. and international current events, noting the fifth session of Queen Victoria’s twelfth Parliament, predicting that Russia is ripe for Revolution, and in the U.S., marking the death fo General Tecumseh Sherman. Publication is listed as by The Evening News Association of Detroit, Michigan. This 127-year-old slice of history can be yours for just $20. If interested, email booksales@gfo.org. 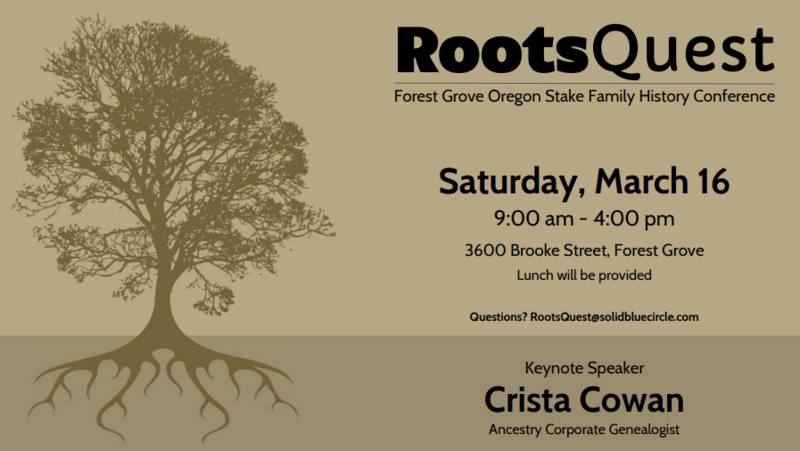 You’re invited to the Forest Grove Oregon Stake Family History Conference annual conference! WHEN? March 16th, 9 a.m. – 4 p.m.
WHERE? This year’s Roots Quest is at 3600 Brooke Street, Forest Grove. WHAT? They have promised to have many wonderful instructors including Crista Cowan – Ancestry Corporate Genealogist. Thank you, Forest Grove, for putting together this wonderful annual event! Feeling inexplicably thirsty while simultaneously soaked through from the rain? Please come see one of our Research Assistants at GFO’s library to reclaim your lost items. Some are featured in the image here, while we also have a plethora of other items crying for their homes. 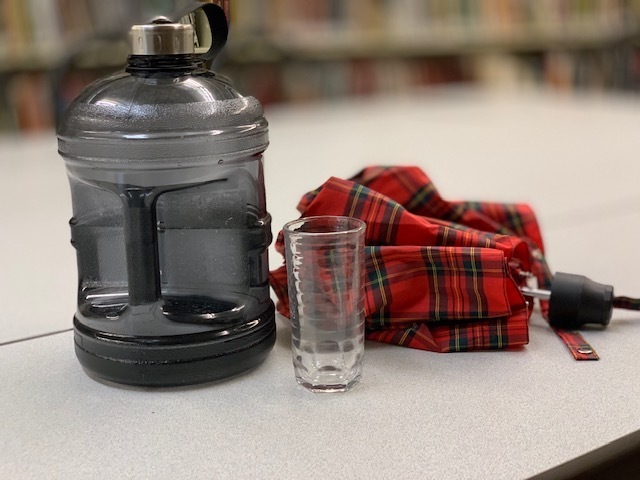 If you think you left an item at our library, call the front desk at 503-963-1932, we’ll check the lost & found box for you. Virginia Group 12:30 – 2:30 p.m.
Have you ever wondered if your ancestor was a Mason or Elk or Odd Fellow? Our first hour features guest speakers Dale and Elsie Deatherage who will discuss techniques for researching the records of fraternal organizations. It is an interesting topic that might shed some light on your family’s history. There will also be time each meeting for discussion, suggestions, and perhaps research on individual research. We’ll also explore the settlement of Kentucky, the Carolinas and Tennessee. Questions? Contact Judi Scott and Carol Surrency at Virginia@gfo.org. Use a multitude of records and sources to trace your ancestors back to their origins in Europe. Explore our manuscript, personal papers and Bible collection while we organize, scan and create finding aids. Drop by at the time that works for you. Questions? Send a note to manuscripts@gfo.org. When he skedaddled: Dissolution of marriage in Ohio, West Virginia, and Virginia, 1845 – 1875. Presented by Nancy Methany. 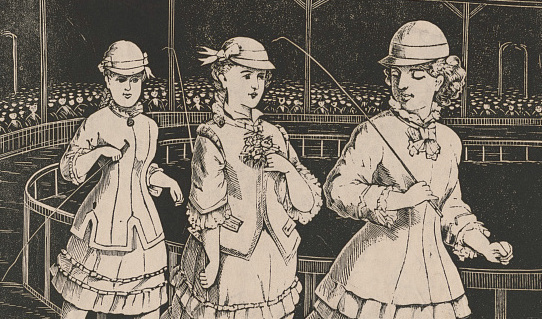 Dissolution of marriage in 19th century Ohio, West Virginia, and Virginia, seemed like a blood sport at times, with barbs flying, blistering accusations, and searing insults. But the legal process to end a marriage can help us a great deal in uncovering valuable evidence of our ancestors with some terrific backstory. Come learn about the laws, records, and customs surrounding the dissolution of marriage in Ohio, West Virginia, and Virginia, 1845 – 1875, to help you on your research journey. Questions? Please reach out to Jeanne Quan and Sandy Alto at learnandchat@gfo.org. Family Tree Maker Road Show – 2 Sessions: 1 – 3 p.m. & 4 – 6 p.m. The first session has sold out, but a few seats remain for Session 2. You can also sign up for the Wait List as sessions fill at website just incase seats open up. Mark Olsen is the Family Tree Maker Ambassador to historical and genealogical societies around the world working to support their members as they use Family Tree Maker.He’ll show new features in Family Tree Maker, moving to its current version and how to get a free update. Also, do you know about FTM’s DNA charting features? Kiara Neilsen teaches classes regarding the use of Family Tree Maker, DNA, and how to use DNA results to further genealogical research. 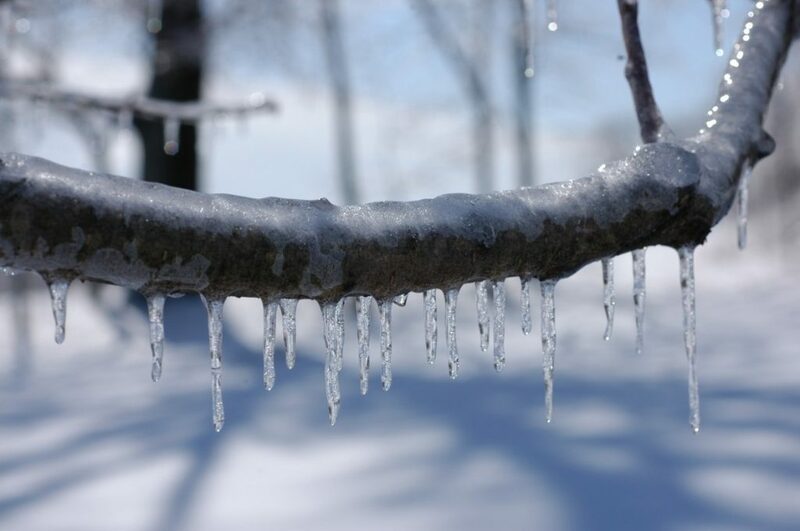 During inclement weather this winter, please be sure to check our Facebook Page or website to see if we’re open! Or, call the library at 503-963-1932 to insure someone is here. We’ve got great news for anyone who uses or is thinking about using Family Tree Maker (FTM) software. The folks behind FTM are coming to the GFO library for a 2-hour interactive presentation on Wednesday, March 6th from 1 to 3 p.m. The event is Free but Requires Registration in case seats run out. Mark Olsen is the Family Tree Maker Ambassador to historical and genealogical societies around the world, working to support their members as they use Family Tree Maker. He’ll show new features in Family Tree Maker, how to move to its current version, and how to get a free update. Also, do you know about FTM’s DNA charting features? Kiara Neilsen teaches classes regarding the use of Family Tree Maker DNA, and how to use DNA results to further genealogical research. “If you have received your DNA results and thought, ‘Now what?’ Charting Companion 7 is a great place to start. Pierre Clothier is the creator of Charting Companion and will join in with us in a live webcast to show off the amazing DNA edition charts both those tied to your DNA findings and your Family Tree Maker trees.” Plus, a little birdie tells us that you might find some discounts available. Registration is open now! Aspiring Archivists at GFO The newest GFO Stars are interns who have been working with the Manuscripts Committee this past year. Trysta came to GFO in 2016 and helped complete the processing of our Jesuale Special Collection. Over the last few months, she developed a policy and procedures guide for GFO’s found-artifacts, which was adopted by the board last month. Emily came to GFO last summer. She completed digitizing the recently donated Stiles Collection and helped with other special projects. Both Trysta and Emily represented GFO at the October 5th Oregon Historical Society Affiliates Summit. They also spearheaded GFO’s participation at this year’s Oregon Archives Crawl. 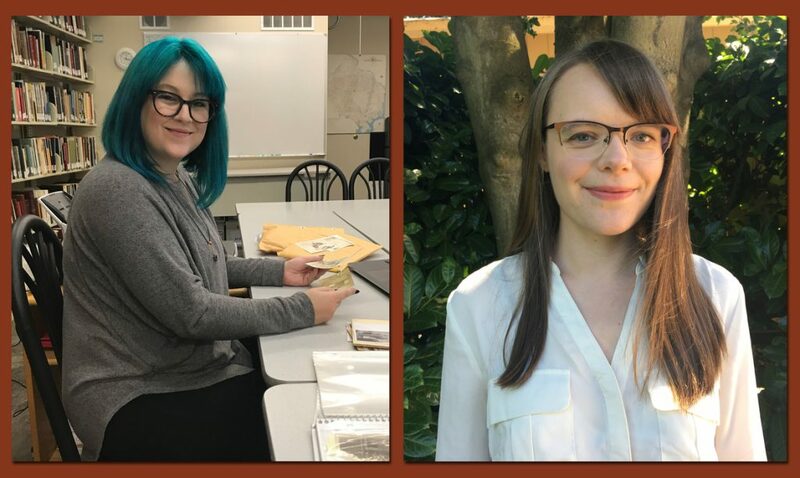 We are so lucky to have their expertise and endless enthusiasm in bolstering GFO’s visibility and professionalism among our local and state-wide history and research repositories. Thank you for all you do for GFO! Our recent inventory revealed a troubling statistic: 199 books are missing from our library. Learn how to get started and how to stay on the right path during Beginners Day at the GFO Open House. 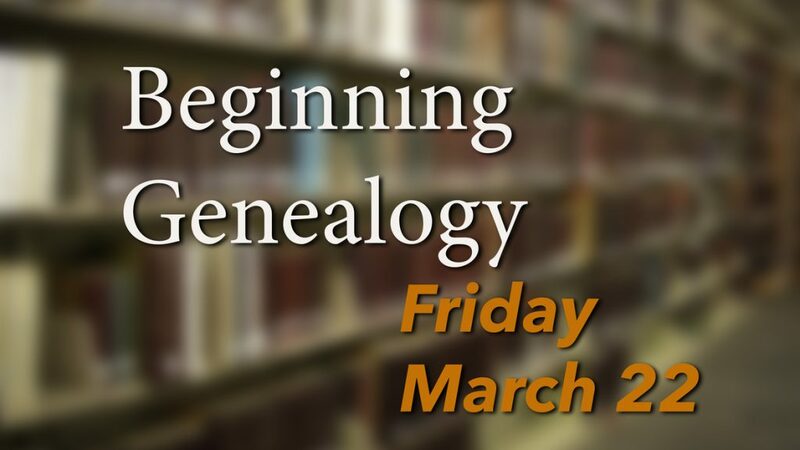 The GFO’s dynamic Laurel Smith offers Beginning Genealogy, a full day FREE class on Sunday March 24th, starting at 9:30 a. m. Seats are gonna be going-going-gone at this event, so be sure to register beginning March 1st at 9 a.m.! 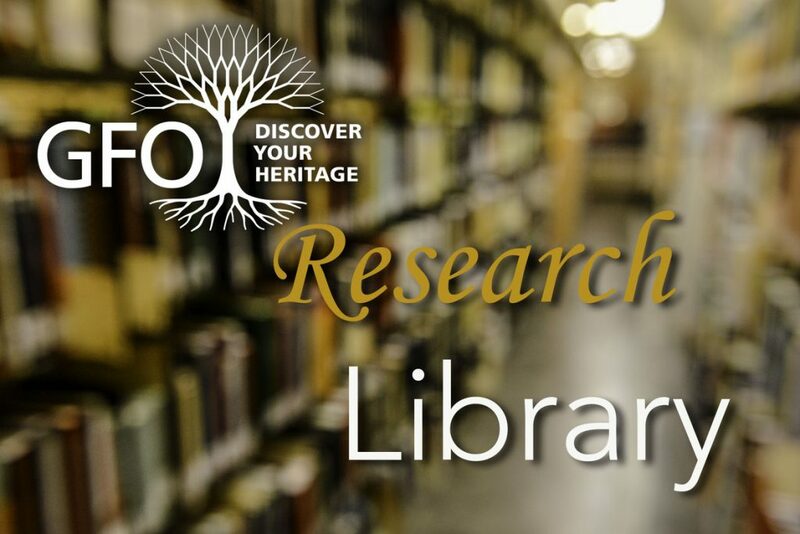 You’ll hear about the wealth of resources available to truly advance your family history research. You MUST register online before March 20th to attend. This event is part of GFO’s Annual Free Open House! Check our website for updates. Don’t Miss Barbara Rae-Venter at GFO’s March 2019 Open House! Photograph by Brian L. Frank You’ve probably already heard GFO has another wonderful Open House planned for next month. But are you absolutely prepared? Did you realize you have the chance to hear from the genetic genealogist who cracked the Golden State Killer case? But you must register to hear her free session. Barbara Rae-Venter is coming to speak at the GFO during our DNA Days! On Saturday, March 30th, Rae-Venter will talk in the afternoon about DNA genealogy research techniques. On the morning of Sunday, March 31st, she’ll speak about the Golden State Killer case itself. Many thanks to Emily Aulicino for arranging this rare opportunity. Barbara’s sleuthing has been profiled in the New York Times, and she was named one of the 10 People Who Mattered most in 2018 by Nature magazine. This will be so popular you must register as the seats will be limited and they’ll be going fast! Registration opens on Friday, March 1 at 9 a.m., at GFO’s website. Save the date and set your DVR. When you watch the new documentary by Oregon Public Broadcasting, see if you notice the GFO library in the background during an interview. 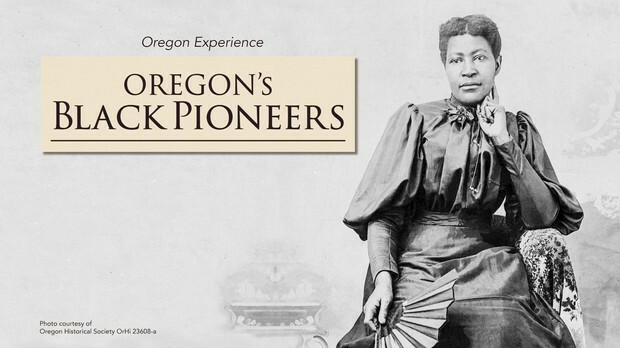 OPB’s release on the new program notes: OPB will premiere a new historical documentary on February 25th called “Oregon’s Black Pioneers,” which explores the largely unknown history of African-Americans who have helped shape the state. This half-hour Oregon Experience documentary explores the many stories of black pioneers, including that of Markus Lopeus, the earliest-known person of African descent in the state. He was a sailor who arrived at Tillamook Bay in 1788 with merchant sea captain Robert Gray. It is documented that Lopeus died during a dispute with local Native Americans. In the 1840s, the region’s provisional government forbid slavery while also banning black people from settling in the area. When Oregon became a state in 1859, it was the only state admitted to the union with an exclusion law in its constitution. That law remained until voters removed it in 1926, while the original racist language stayed on the books until 2002. “Oregon’s Black Pioneers” premieres on OPB TV Monday, February 25th at 9 p.m. and will be available to watch online at the same time at opb.org/blackpioneers. We were pleased to host Oregon Experience for a small part of this project. Immediate Opening: We Need a Webmaster! We learned this week that our wonderful GFO Webmaster, Maggie McNair, must step away from this important role. Do you have website experience? We Need You! Fortunately, our website service already provides a stable template so the design is already set, and our CMS is user friendly. However, we have a deep website with many searchable records and we need someone to help keep the site updated. Please contact president@gfo.org if you have the skills and some spare time to offer us. This is a volunteer position. In fact, the GFO is all-volunteer. We have no paid staff of any kind. Maggie, we’re going to miss you! This meeting’s presentation by Emily Aulicino will briefly cover the three major tests (Y-DNA, mtDNA, and atDNA) and then will show you what action to take regarding your matches. The focus will be on preparing for your matches, identifying the patters with your matches, and then some tips on contacting those matches. Please download the handout here. This is a beginning DNA presentation, but anyone is welcome. Genetic Genealogy is the most accurate tool a genealogist has. 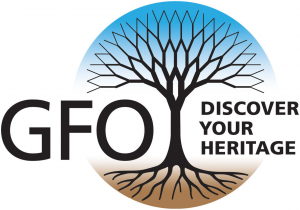 If you are prepared to discover whether your genealogical paper trail is accurate, and if you are willing to take some time outside of our meetings to reinforce what you learn at each session, the GFO Beginners DNA Interest Group is for you. You are welcome to email any questions for Emily to dna_ea@gfo.org before the meeting. African American Ancestry Group 12:30 – 2:30 p.m. Meetings: Monthly on the 4th Saturday of the month at 12:30 p.m.
“During January’s remote presentation from Nicka Smith, she discovered that most of the attendees did not know about the genealogy site FamilySearch.org, and she highly recommended that we try to correct that, so this month I will be giving a talk about the site. One of its greatest strengths is that it is totally free to use, with a wealth of records and other material helpful to researchers. For those who were unable to attend Nicka’s presentation, or who simply want to hear it again, she has made it available to us at on Youtube. If you know of any other people interested in African American genealogy, please be sure they know about this amazing group! You do not have to be a GFO member to participate. For more information, contact us at african_american@gfo.org. British Group 1 – 3 p.m.
For this meeting, we’ll discuss online and news sources, recent successes, brick walls you might be struggling with. 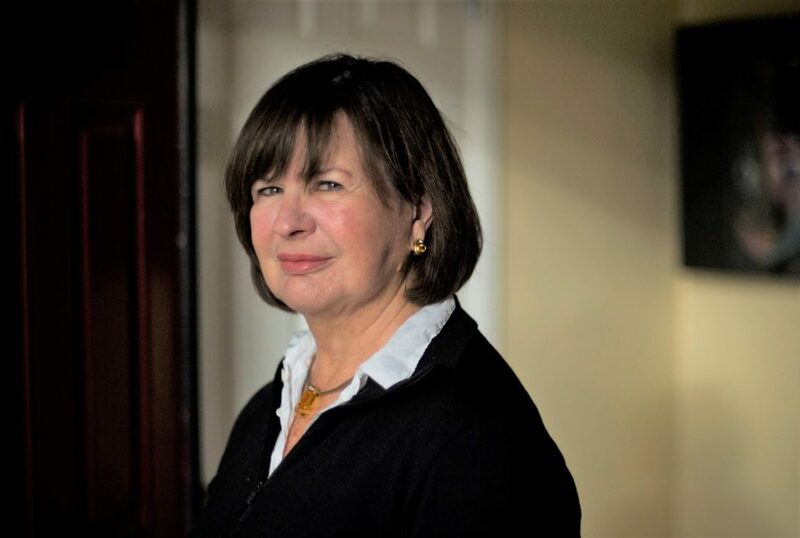 Judith Leppert will also spend time explaining the ins and outs of the FindMyPast website! Questions? Email the group leaders at uk@gfo.org. Please note, GFO’s Library will close after 12:45 p.m. on Saturday, February 23rd, for the above-noted Special Interest Group sessions. Our ancestors were real people with passions, problems, loves, and controversies, but the bare facts of genealogy, those important names, dates, and places, don’t give us much sense of who these people were or what their lives were like. Learn to dig deeply into the genealogical details to breathe life into your ancestors’ stories. Creating a captivating ancestral tale from genealogical facts is like turning fish eggs into caviar: the facts don’t change, but the way you describe them makes all the difference. With good research, thoughtful planning, and a dash of ingenuity, we can create engaging genealogical stories designed to entice even seemingly disinterested readers. Pam Vestal entered the field of genealogy after a 21-year career as a professional writer. 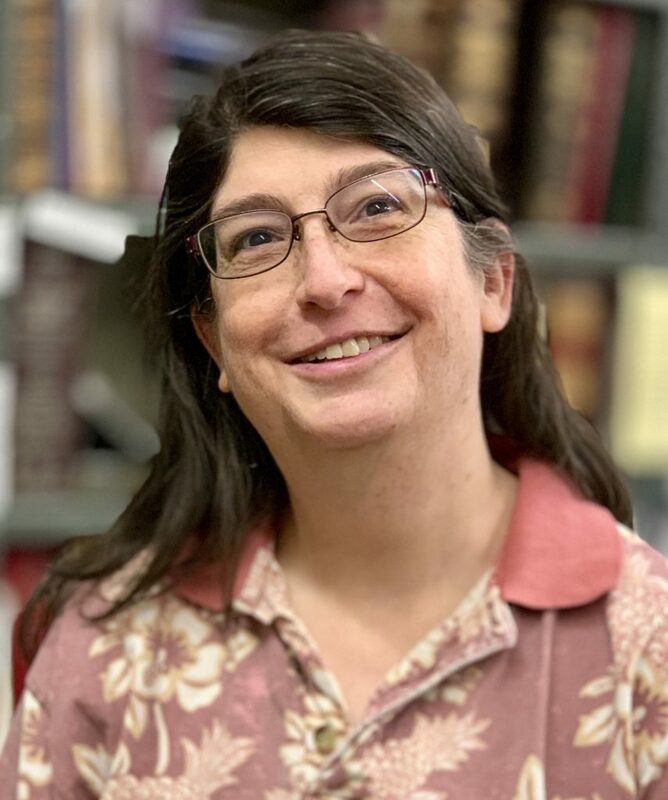 She does genealogical research for clients, has articles published in the Association of Professional Genealogists Quarterly, and lectures up and down the West Coast.